Germany has two coastlines, one facing northwest on the North Sea and the other facing northeast on the Baltic Sea. 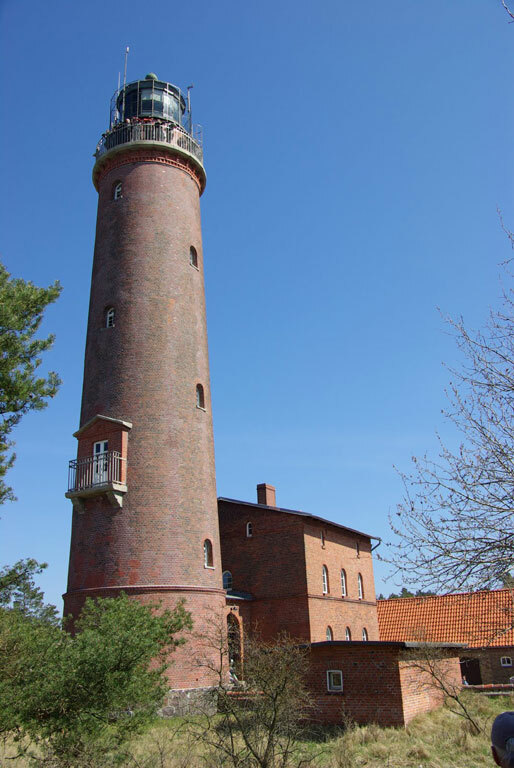 This page lists lighthouses of the Baltic coast in Vorpommern, part of the state of Mecklenburg-Vorpommern. Before the creation of the German Empire in 1871 all of this region was part of the Kingdom of Prussia. From the end of World War II until the reunification of Germany in 1991 it was part of the German Democratic Republic (East Germany). Mecklenburg includes the western portion of this coast (the Wismar, Warnemünde, and Rostock areas), while Vorpommern (Lower or Western Pomerania) includes the eastern section from the Stralsund area to the Polish border. Interest in lighthouses is strong in Germany, and most of the towers are in good condition. A federal law provides blanket protection to historic lighthouses. There is concern, however, that many of the lights may be deactivated in the coming years as navigators depend less and less on them. In German, a lighthouse is a Leuchtturm ("light tower"), plural Leuchttürme. The front light of a range is the Unterfeuer and the rear light is the Oberfeuer. Modern range lighthouses are crowned by a topmark: a large, distinctive structure that serves to mark the range clearly in the daytime. 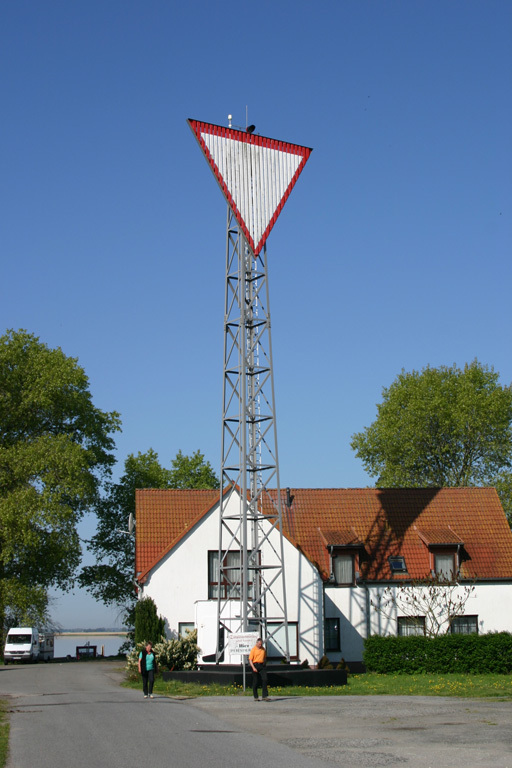 Lighthouses in Germany are operated by the regional harbor authority, called the WSA (Wasser- und Schiffahrtsamt). 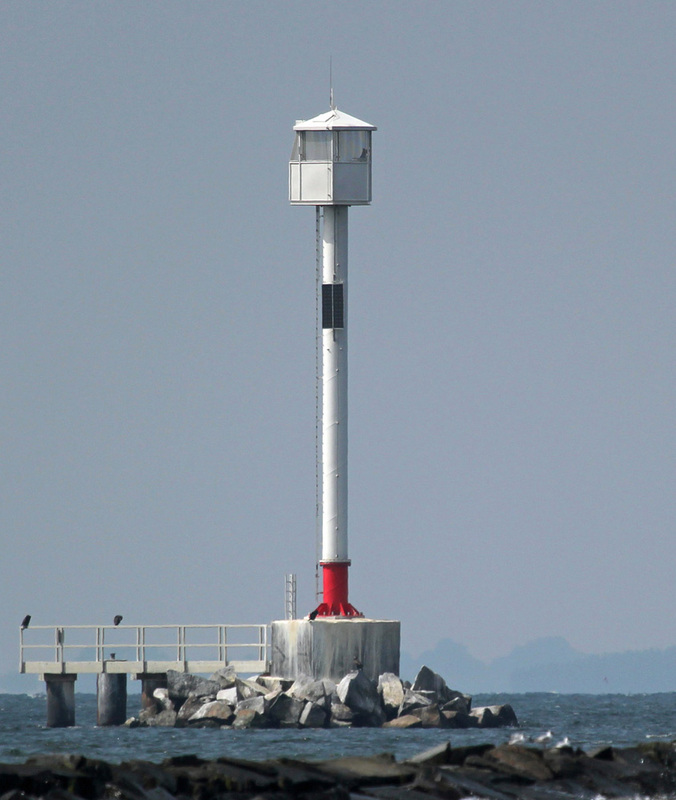 The lighthouses on this page are managed by WSA Stralsund. The WSA's are linked to and regulated by a federal agency, the Wasser- und Schifffahrtsverwaltung des Bundes (WSV). Navigation chart for Germany's Baltic coast. 1933 (light station established 1911; fog signal station established 1897). Inactive since 2014 and reported demolished at least by 2018. This was a 8 m (26 ft) square brick tower with gallery, rising from one corner of a 1-story generator house. Lantern removed and stored for possible future display. The tower was unpainted red brick; the lantern was painted white with a red roof. Werning has a photo and Leuchtturm-Atlas has a page with photos. Google has a satellite view of the former location. The original light was fastened to the chimney of the fog signal generator house. 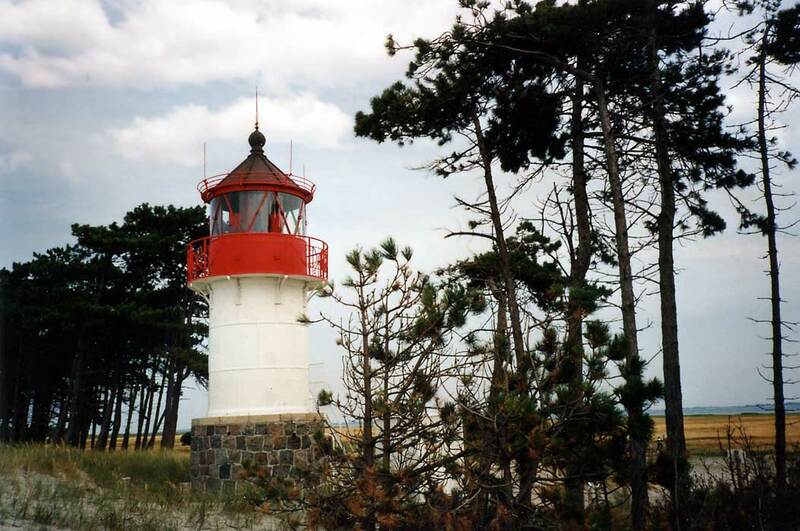 This light is in Fischland, a narrow, sandy barrier isthmus connecting the mainland to the Darß-Zingst peninsula. 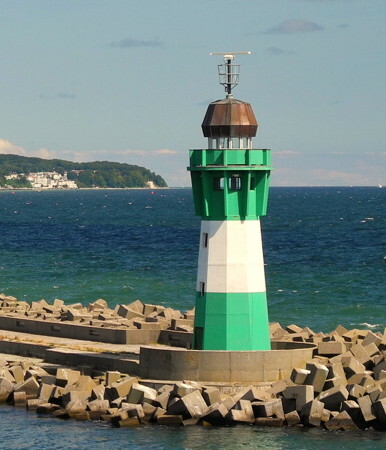 The government resisted placing a light here in addition to the Darßer Ort lighthouse, but gave in when so many ships kept wrecking on the beach in the area. In September 2013 a new light (focal plane 11 m (36 ft); white light, occulting three times every 12 s) was placed on a mast on the Wustrow pier. 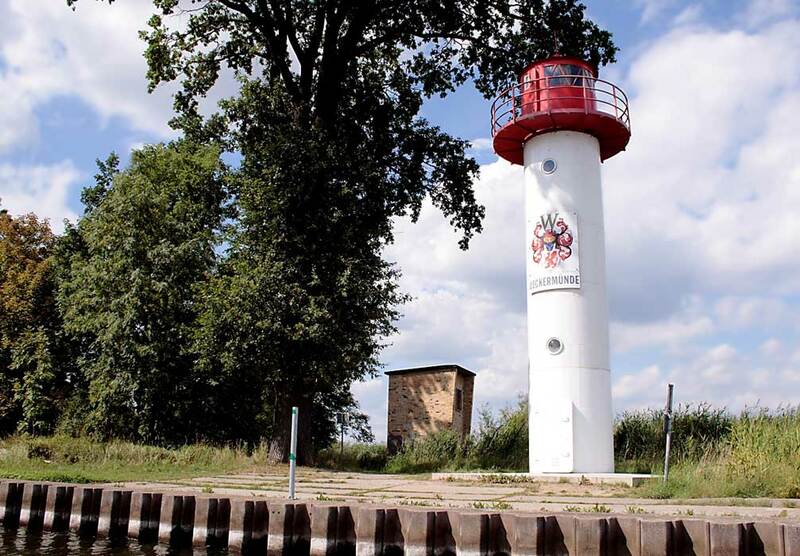 The historic lighthouse was deactivated in April 2014 and the lantern was removed to storage by WSA Stralsund. The buildings were demolished. Located just behind the beach near Ostseebad Wustrow, about 30 km (19 mi) southwest of Darßer Ort. Site open, tower closed. Operator: WSA Stralsund. ARLHS FED-267; Admiralty C1436; NGA 3512. 1848. Active; focal plane 33 m (108 ft); six white flashes, in a 4+2 pattern, every 22 s. 35 m (115 ft) round brick tower, unpainted, with lantern and gallery. 2-story keeper's house, painted white, and other light station buildings. Michael Mertens's photo is at right, Hartmann has a page for the lighthouse, Werning has a photo, Trabas has a closeup by Stefan Hix, Wikimedia has a photo, Huelse has a historic postcard view, and Google has a street view and a satellite view. 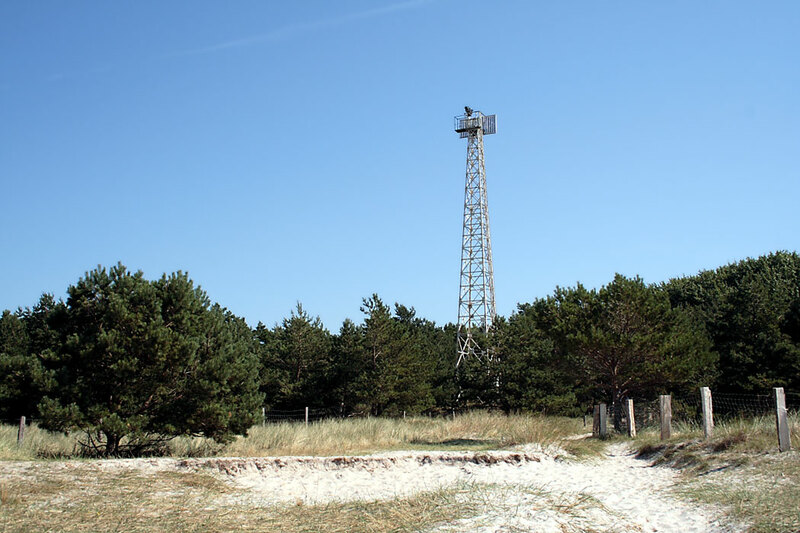 Darßer Ort is a sandy promontory with large dunes sheltering an unusual maritime forest. The lighthouse was restored in 1994. Opened to the public in 1995, this historic station has quickly become one of Germany's best known and most visited lighthouses. Following reunification the national park service restored the station and the Deutsches Meeresmuseum in Stralsund established an aquarium and nature museum, the Natureum Darßer Ort, in the keeper's house and other buildings. 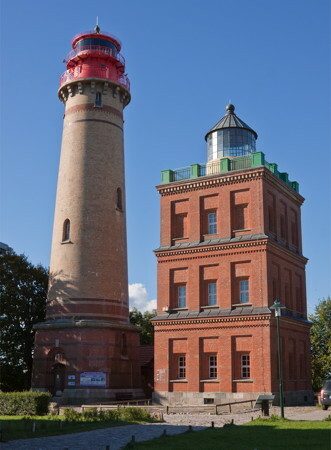 Most visitors also climb the tower for its spectacular view over the Baltic; in good weather the Danish island of Falster can be seen across the mouth of the Mecklenburger Bucht. Located on the point of Darßer Ort about 5 km (3 mi) west of Ostseebad Prerow. Site open, museum and tower open daily May through October daily except Mondays and Tuesdays the rest of the year. Operator: WSA Stralsund. Site manager: Nationalpark Vorpommersche Boddenlandschaft. ARLHS FED-070; Admiralty C1440; NGA 3516. 2013. Active; focal plane about 14 m (46 ft); yellow flash every 4 s. 14 m (46 ft) post carrying a large round diving bell (Tauchgondol) that can be lowered on the post. Trabas has a photo by Capt. Peter Mosselberger, Karsten Bechstedt has a pier view, and Google has a satellite view. 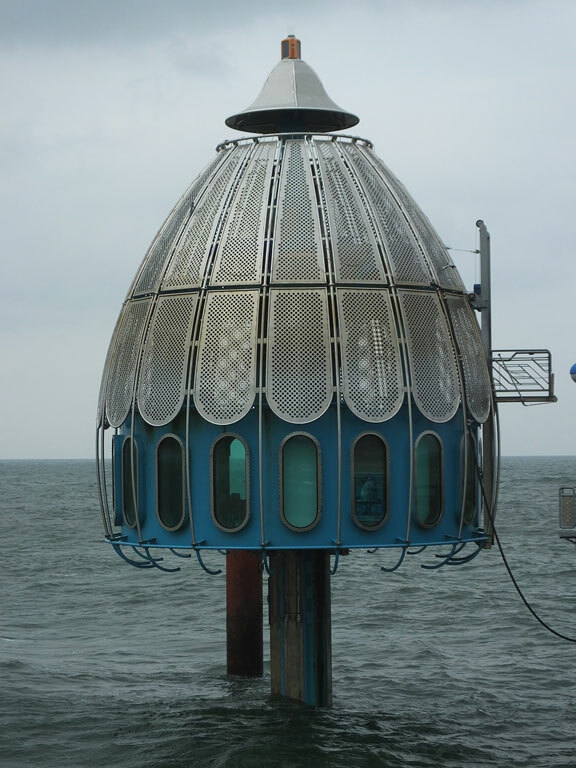 The diving bell is a tourist attraction, one of several such attractions Germany's Baltic coast. Located near the end of the pier at Zinnowitz, a resort town about 15 km (9 mi) southeast of Darßer Ort. Site and diving bell open. Admiralty C1439.9. 1940 (station established 1900). Active; focal plane 23 m (75 ft); white, red, or green light, depending on direction, occulting once every 6 s, synchronized with the Bock Unterfeuer and Zarrenzin Oberfeuer lights. 23 m (75 ft) square skeletal tower with lantern and gallery. Tower painted white, lantern and gallery painted red. Trabas has a view of the Bock range by Karl-Heinz Wellm, Hartmann has a page for the range, and Google has a satellite view. The entrance to Stralsund from the north is through a narrow passage between the barrier islands of Bock and Hiddensee. The Zarrenzin range guides ships approaching Stralsund from the Baltic, while the Bock range guides ships leaving Stralsund. 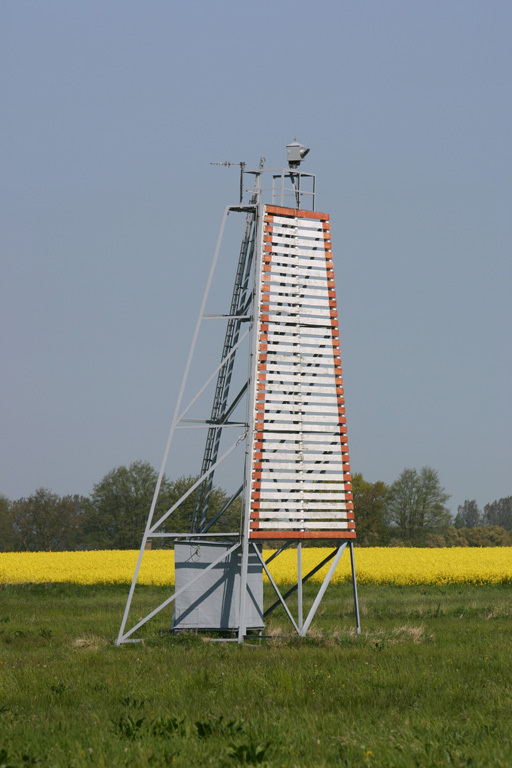 In addition to the range lights, this tower displays directional lights for nearby ships. Located on the north coast of Bock, an uninhabited island incorporated into the Vorpommersche national park. Accessible only by boat. Site open, tower closed. Operator: WSA Stralsund. Site manager: Nationalpark Vorpommersche Boddenlandschaft. Admiralty C2576; NGA 5876. 1940 (station established 1910). Active; focal plane 12 m (39 ft); white light, occulting once every 6 s, synchronized with the rear light. 13 m (43 ft) square skeletal tower with lantern and gallery. Tower painted white, lantern and gallery painted red. Trabas has a good photo, Hartmann has a page with a photo, and Google has a satellite view. Located on the south coast of Bock about 1100 m (0.7 mi) south southeast of the Oberfeuer. Accessible only by boat, but there is a good view of this light (across a narrow channel) from the waterfront of Barhöft on the mainland. Site open, tower closed. Operator: WSA Stralsund. Site manager: Nationalpark Vorpommersche Boddenlandschaft. Admiralty C2575.9; NGA 5872. 1940. Active; focal plane 52 m (171 ft); white light, occulting once every 6 s, synchronized with the front light. 24 m square skeletal tower with square lantern and gallery. Tower painted with red and white horizontal bands; the lantern and gallery are red, but the lantern roof is white. Trabas has a photo, Hartmann has a page for the range, and Google has a satellite view. 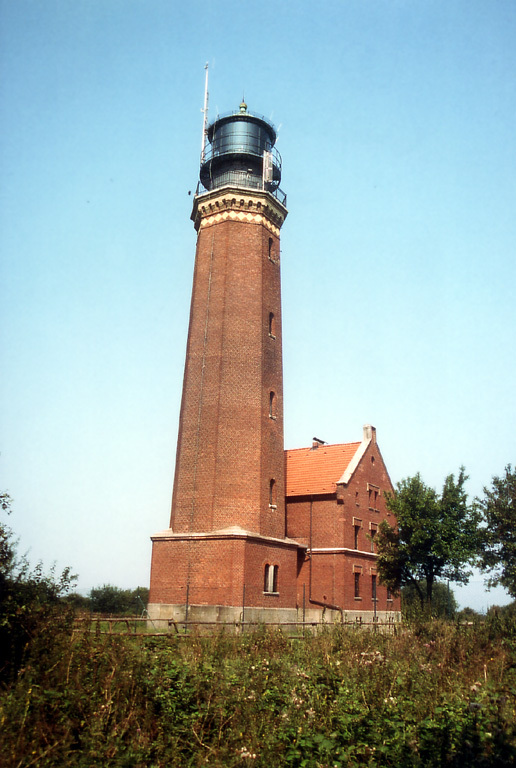 Located in a field on the mainland, at the high point of the Barhöft peninsula about halfway between Barhöft and Zarrenzin, 2.1 km (1.3 mi) south southwest of the front light. Site status unknown. Operator: WSA Stralsund. Admiralty C2576.1; NGA 5880. Note: Hiddensee is a barrier island on the west side of Rügen; it is accessible by ferry from Schaprode on Rügen or from Stralsund. Private vehicles are prohibited on the island; visitor transportation is available on electric-powered buses or horse-drawn carriages. 1905 (Julius Pintsch). 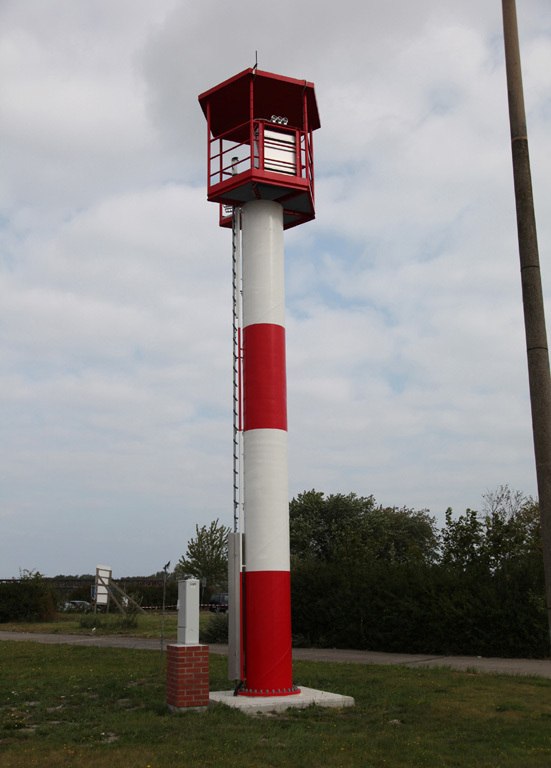 Active; focal plane 10 m (33 ft); white, red, or green light, depending on direction, occulting twice every 10 s. 12 m (40 ft) round cylindrical cast iron tower with lantern and gallery, mounted on a stone base. 4th order Fresnel lens in use. Tower painted white, lantern and gallery red, lantern roof black. A photo is at the top of this page, Hartmann has a page for the lighthouse, Werning has a photo, Trabas has a nice closeup by Klaus Kern, Wikimedia has closeup, Daniel Schumann has a street view, and Google has a satellite view. 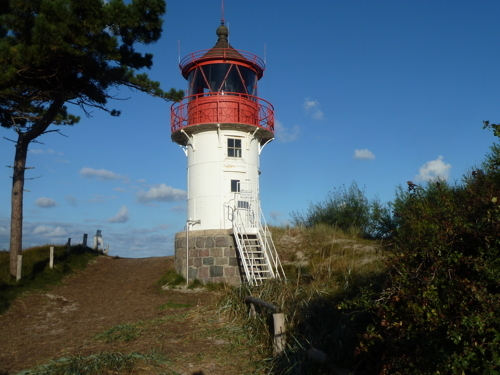 This small lighthouse is roughly midway along the narrow barrier island of Hiddensee. Located just behind the dunes a short distance south of the ferry terminal at Plogshagen. Site open, tower closed. Operator: WSA Stralsund. Site manager: Nationalpark Vorpommersche Boddenlandschaft. ARLHS FED-088; Admiralty C2586; NGA 5868. 1888. Active; focal plane 95 m (312 ft); white light, 2.4 s on, 7.6 s off; a red sector is shown to the south southwest along the coast of Hiddensee. 28 m (92 ft) round masonry tower with lantern and gallery, painted white; lantern roof painted red. A photo by Felix König is at right, Hartmann has a page for the lighthouse, Werning has a photo, Trabas has a closeup by Klaus Kern, Michel Rothboeck has a street view, and Google has a satellite view. This handsome lighthouse is built on a high dune called Bakenberg (Beacon Hill); the hill is covered with thorn bushes, for which the light is named. The tower was originally round; in 1927 it was strengthened by building the present 12-sided outer wall. Huelse has a historic postcard view showing the original appearance. After reunification, WSV restored the tower and opened it to the public in 1994. Located at the end of the road on the northern end of Hiddensee. Site open; tower open daily May through September and Tuesday through Saturday in April and October, with additional openings over the Christmas holiday. Operator: WSA Stralsund. Site manager: Nationalpark Vorpommersche Boddenlandschaft. ARLHS FED-026; Admiralty C2588; NGA 5864. Note: Rügen is a large island north and northeast of Stralsund, separated from the mainland by the narrow strait of the Strelasund. Readily accessible by a bridge from Stralsund (the Rügenbrücke), Rügen is one of the country's most popular resort areas. Date unknown (station established 1938). 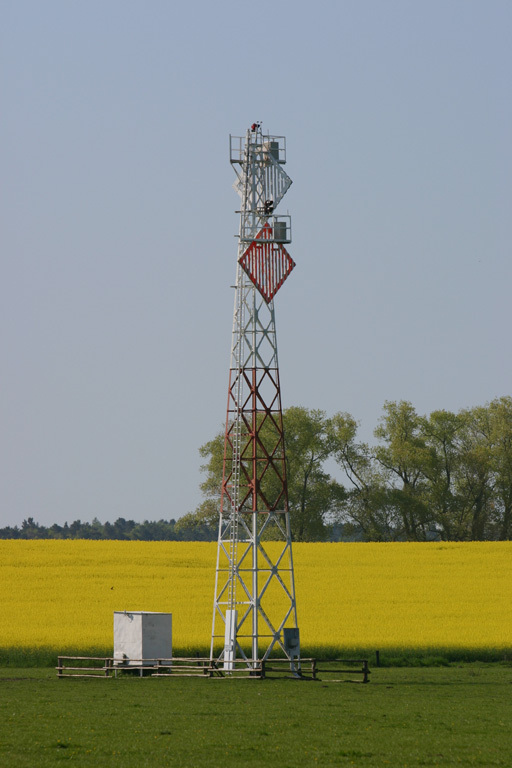 Active; focal plane 30 m (98 ft); white light occulting once every 6 s. 18 m (59 ft) square skeletal tower, painted with red and white horizontal bands. 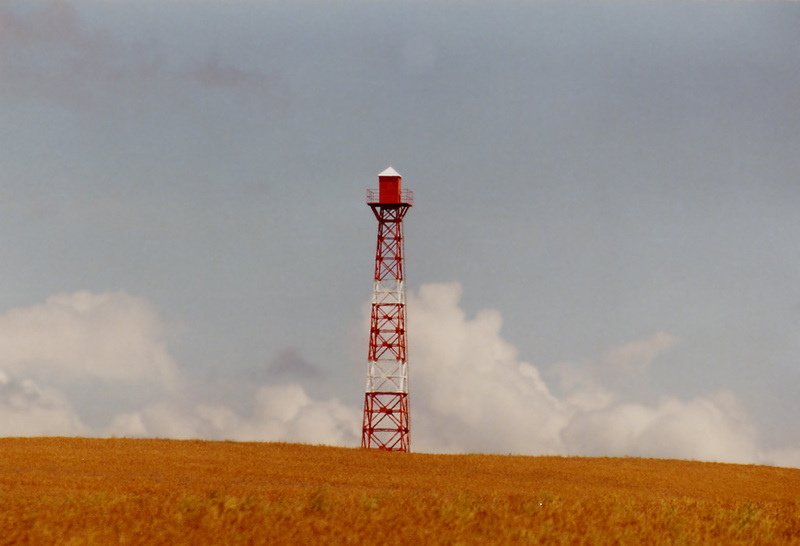 The tower carries a large diamond-shaped slatted daymark painted white with a red edge. Trabas has a photo by Klaus Potschien, and Google has a satellite view. This range is the reverse of the Bock Range; it guides vessels entering the Strelasund from the northwest. The front light is on a shorter skeletal tower. Located beside a farm road about 4 km (2.5 mi) northeast of Altefähr. Site open, tower closed. Admiralty C2585.1; NGA 5896. Date unknown. Inactive since 2013 and since demolished. 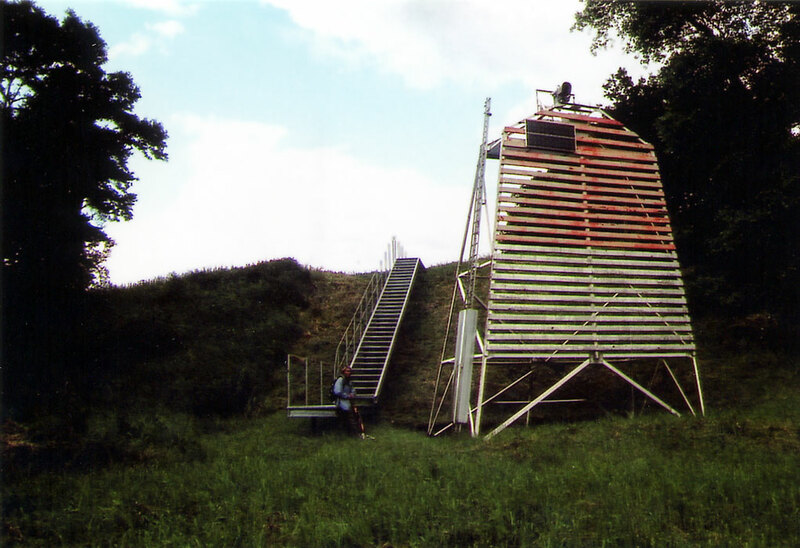 This was a 24 m (79 ft) square skeletal tower, painted white. 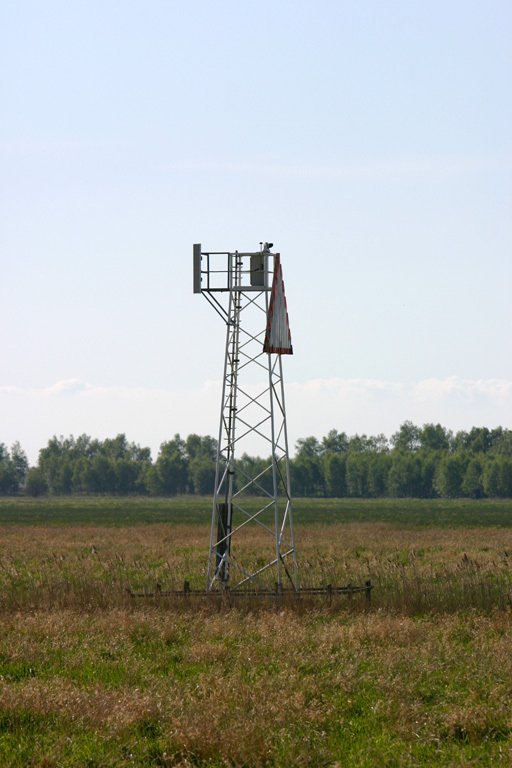 The tower also carried a triangular daymark, point down, painted white with a black border. Trabas has a photo but the tower is no longer seen in Google's satellite view. This range guided vessels northbound in the sound between Hiddensee and Rügen. 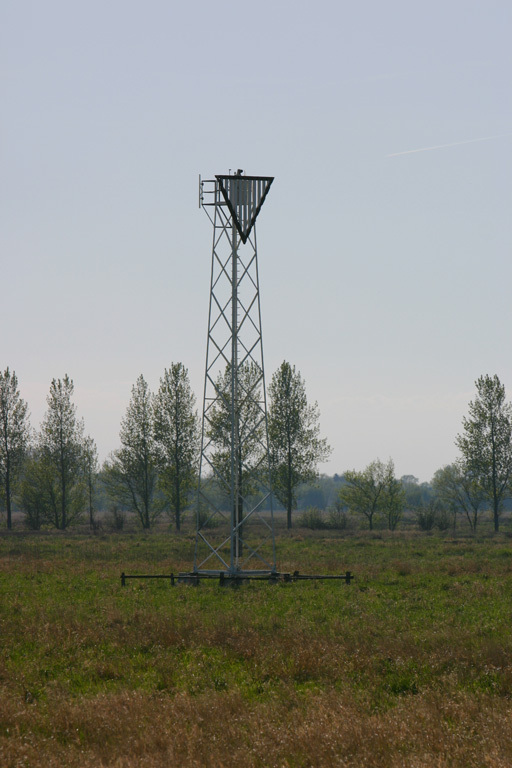 The front light was on a similar tower 11 m (36 ft) in height. Located on a low point near the westernmost tip of Rügen. Site status unknown. ex-Admiralty C2589.31. Date unknown. 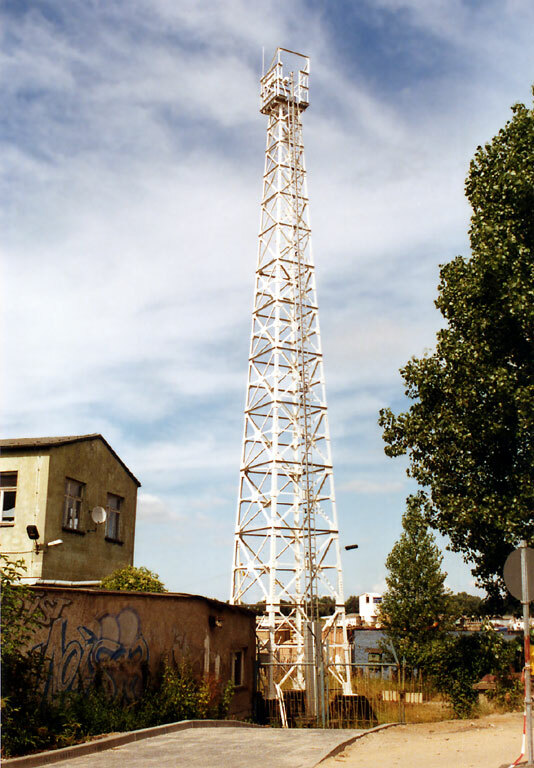 Active; focal plane 20 m (66 ft); white light occulting twice every 10 s. 17 m (56 ft) square skeletal tower, painted white. The tower also carries a triangular daymark, point down, painted white with a black border. Trabas has a photo, and Google has a satellite view. 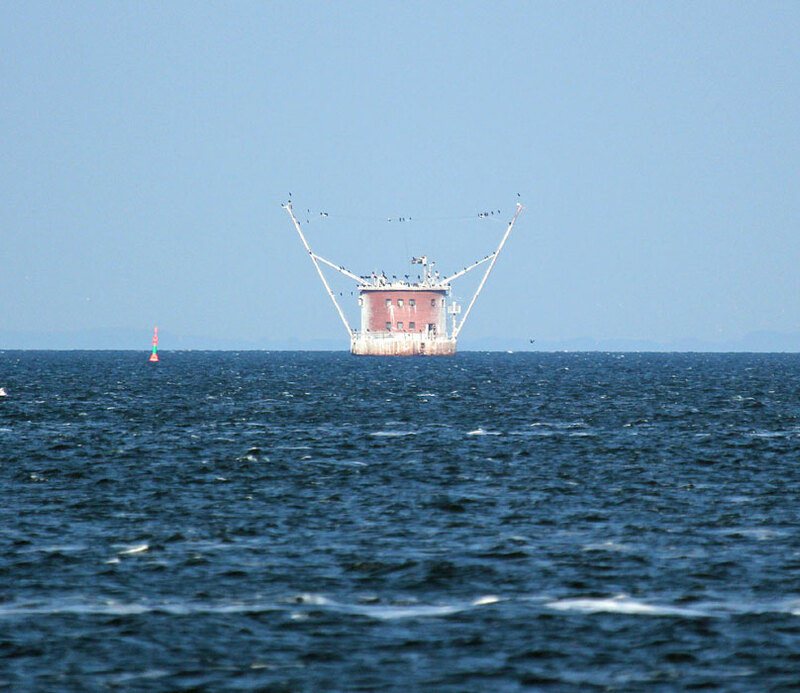 This range guides vessels southbound in the sound between Hiddensee and Bug. The front light is on a shorter skeletal tower. Located next to a road on a low point near the village of Poggenhof. Site open, tower closed. Admiralty C2589.41. 1828 (Friedrich Karl Schinkel). Inactive since 1902. 21 m (69 ft) square 3-stage brick tower with lantern and gallery, incorporating keeper's quarters. Tower is unpainted red brick; lantern has a black roof. 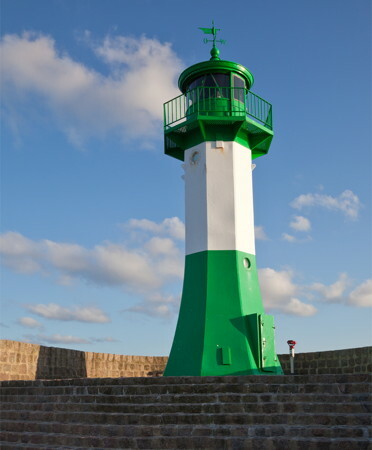 A photo is at the top of this page, Hartmann has a page for the lighthouses, Anett Jauernig has a closeup photo, Wikimedia has photos, and Huelse has a historic postcard view showing both lighthouses. 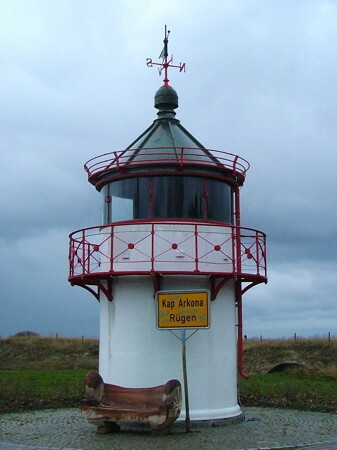 Kap Arkona, near the northern tip of Rügen, is the most prominent and dangerous cape on Germany's Baltic coast, so it is not surprising that the Kingdom of Prussia built this light station as early as 1828. The original tower was restored after reunification and opened to the public in 1993. Since 1996 it has housed a maritime and historical museum, which has since expanded to include a nearby keeper's house. The lighthouse also includes a registrar's office and is available for weddings. Its nickname Schinkelturm honors its designer, a Berlin architect. Located on the cape, near Putgarten on the Wittow peninsula. Site open, museum and tower open daily year round (hours vary). Site manager: Schinkelturm am Kap Arkona. ARLHS FED-065. 1902 (station established 1828). Active; focal plane 75 m; three white flashes, separated by 4 s, every 17 s. 35 m (115 ft) round brick tower with lantern and double gallery, rising from an octagonal granite base. Tower unpainted; lantern, watch room, and galleries painted red. A photo is at the top of this page, Hartmann has a page for the lighthouses, Trabas has a good photo by Stephan Hix, Werning has a photo, Wikimedia has photos, Stefan Kassner has a street view, Jeffrey Martin has a 360° view from atop the tower, and Google has a satellite view. This wonderful German Imperial tower stands behind the original lighthouse and has been open to the public since 1996. Site open, tower open daily April through October. Operator: WSA Stralsund. ARLHS FED-010; Admiralty C2592; NGA 5900. 1905 (Julius Pintsch). Inactive since 1999. 6 m (20 ft) round cylindrical cast iron tower with lantern and half-gallery, painted white. 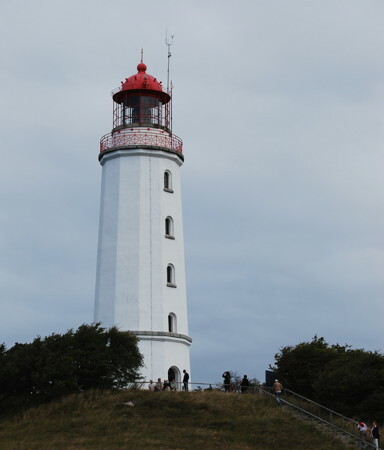 The lighthouse was located on a headland of the Jasmund peninsula about 2 km (3 mi) east of Lohme. In 2002 it was relocated to Kap Arkona for display as part of the Schinkelturm museum. Myhre's photo is at right, Hartmann has a page for the light, Bernd Claußen has a good photo, and Google has a street view and a satellite view. Werning's photo shows the lighthouse at its original location. Site open, tower closed. Site manager: Schinkelturm am Kap Arkona. ARLHS FED-193; ex-Admiralty C2594. 1905 (Julius Pintsch). Active; focal plane 30 m (98 ft); white light, 1.5 s on, 4.5 s off; a narrow red sector is shone to the south over rocks close to shore. 7 m (23 ft) round cylindrical cast iron tower with lantern and half-gallery, painted white with red trim; lantern roof is black. 5th order Fresnel lens in use. Trabas has a great closeup photo by Klaus Potschien and Hartmann's page has a similar photo, but the lighthouse hides in the trees in Google's satellite view of the cape. A twin of the Ranzow lighthouse (see above). Located on a ledge on the lower part of a 100 m (33 ft) forested cliff at the eastern tip of the Jasmund peninsula on the northeast side of Rügen about 6.5 km (4 mi) east of Hagen. Accessible by hiking trails in the Jasmund National Park. Site open, tower closed. Operator: WSA Stralsund. Site manager: Nationalpark Jasmund. ARLHS FED-129; Admiralty C2596; NGA 5912. 1937 (station established 1904). 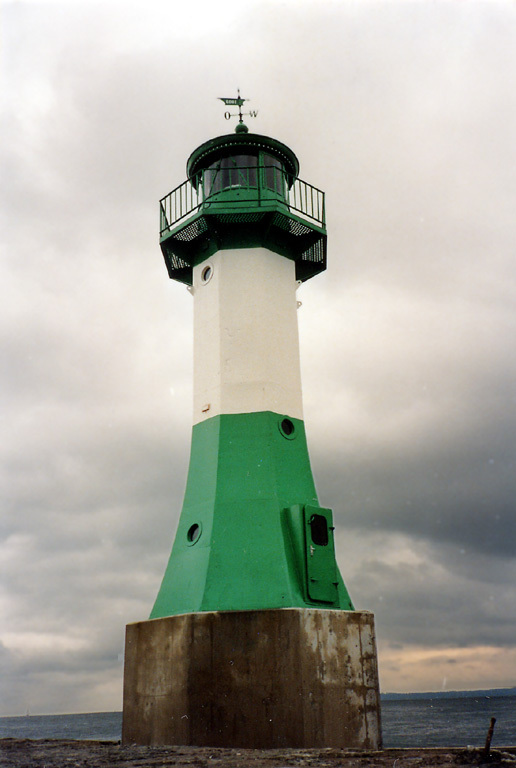 Active; focal plane 15 m (49 ft); white, red, or green light, depending on direction, occulting once every 6 s. 12 m (40 ft) tapered octagonal cast iron tower with lantern and gallery, painted green with one white horizontal band. 6th order Fresnel lens in use. A photo is at right, Hartmann has a page with a photo, Trabas has a fine closeup by Klaus Kern, Werning also has a photo, Alexander Barnickel has a street view, and Google has a satellite view and a distant street view. Michel Forand has a postcard view of the original lighthouse. Saßnitz has been replaced by Mukran as the principal ferry terminal for Rügen; the port is now used by fishermen and recreational boaters. 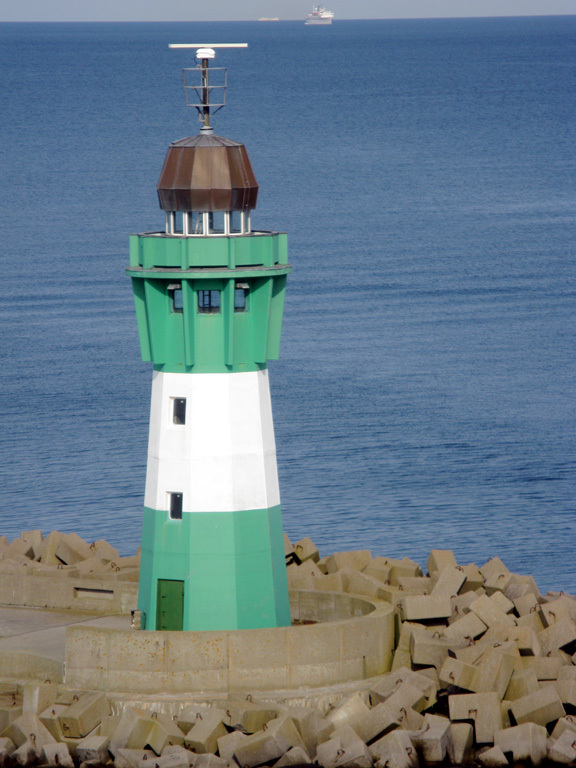 This lighthouse stands at the end of the 1500 m (0.9 mi) east mole at the harbor entrance; accessible by walking the mole. Site open, tower closed. Operator: WSA Stralsund. ARLHS FED-207; Admiralty C2602; NGA 5916. 1977 (station established 1911). 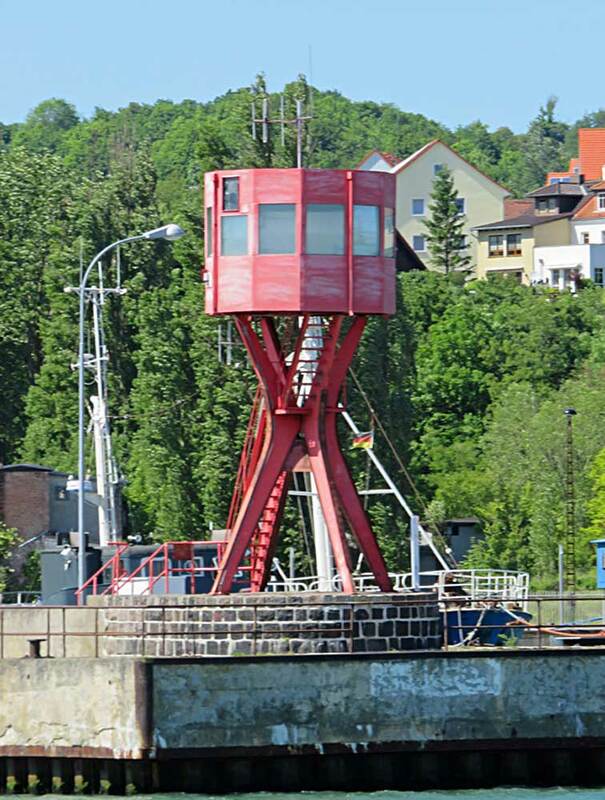 Active; focal plane 10 m (33 ft); continuous red light; the tower also carries the front light of the Saßnitz Entrance Range, a red light occulting twice every 10 s, at a focal plane of 11 m (36 ft). 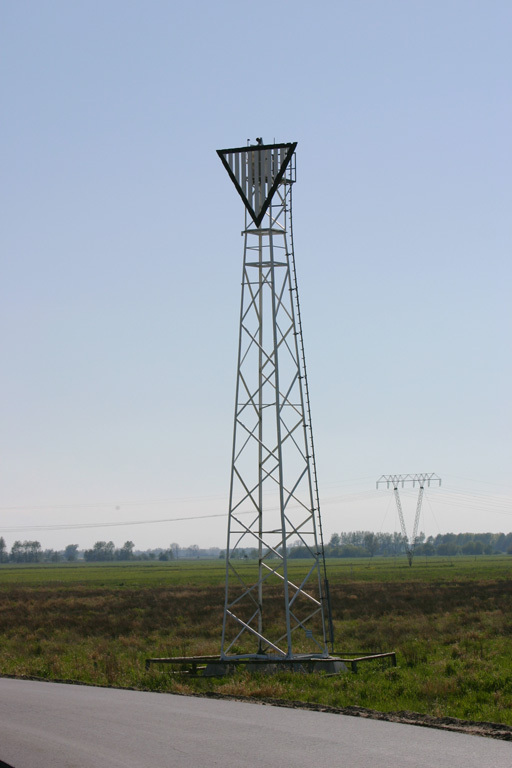 7 m (23 ft) tower in an unusual design: a large drum-style, 12-sided lantern supported by four L-shaped steel legs. Entire structure painted red. Trabas has a good photo by Hartmann, Werning has another good photo, Hartmann has a page for the range, and Google has a street view and a satellite view. The original light was on a wood skeletal tower. Located at the end of the short west mole at the harbor entrance; accessible by walking the mole. Site open, tower closed. Operator: WSA Stralsund. ARLHS FED-208; Admiralty C2604; NGA 5920. 1977. Active; focal plane 14 m (46 ft); red light occulting twice every 10 s (synchronized with the front light). Approx. 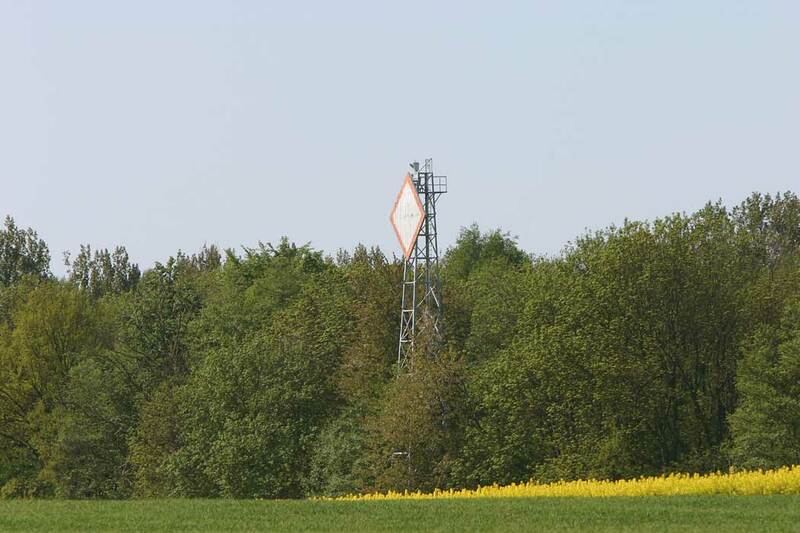 13 m (43 ft) square skeletal tower, painted white and carrying a triangular daymark painted white with a red border. Trabas has a photo by Hartmann, Hartmann has a page for the two range lights, and Google has a satellite view. Located near the waterfront of Saßnitz harbor. Site status unknown. Admiralty C2604.1; NGA 5928. 1995. Active (privately maintained by the harbor operator); focal plane 16 m (52 ft); white or red light, depending on direction, 2 s on, 2 s off. 14 m (46 ft) octagonal tower with lantern and gallery, painted green with one white horizontal band. A photo is at right, Hartmann has a page for the light, Trabas has a photo by Klaus Kern, and Google has a satellite view. Located at the end of the north mole at Mukran, the new harbor of Saßnitz, about 5 km (3 mi) southwest of the old harbor. Site and tower closed; the mole is not open for walking. Good views from shore and better views from ferries departing the harbor for the Danish island of Bornholm, for Klaipeda, Lithuania, and for other destinations. Operator: Fährhafen Saßnitz GmbH. ARLHS FED-272; Admiralty C2614; NGA 5938.7. 1986. Inactive since 1999. Approx. 23 m (75 ft) slender triangular concrete tower with a 2-story triangular lantern structure with double gallery. The lantern carries an array of antennas. The tower is unpainted concrete. Werning has a good photo and Google has a satellite view. This modern structure was probably built more as a communications tower than as a lighthouse, although it carried a navigational light for 13 years. The light was a directional light for ships bound for Saßnitz. Located beside the coastal road in a pine forest about 20 km (13 mi) south of Saßnitz. Site open, tower closed. Owner/operator: unknown. ARLHS FED-190; ex-Admiralty C2612. 2008. Active; focal plane about 14 m (46 ft); yellow flash every 4 s. 14 m (46 ft) post carrying a large round diving bell (Tauchgondol) that can be lowered on the post. Trabas has Thomas Quatsling's photo, Oleksandr Cheban has a pier view, and Google has a satellite view. 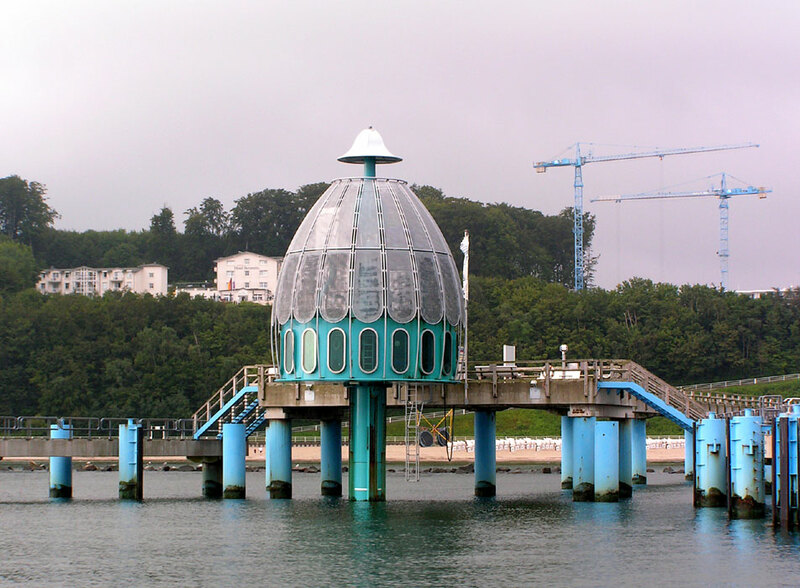 The diving bell is a tourist attraction, one of several such attractions Germany's Baltic coast. 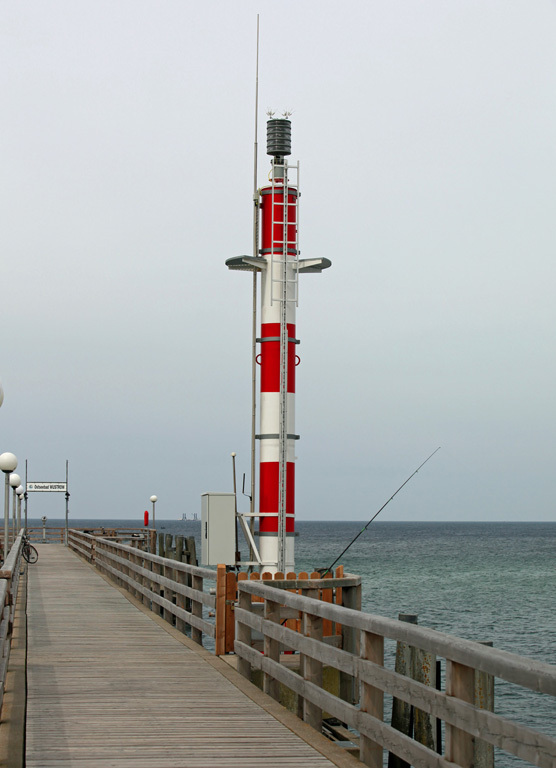 Located at the end of the pier at Sellin, a resort town on the southeastern peninsula of Rügen. Site and diving bell open. Admiralty C2618; NGA 5942. Date unknown. 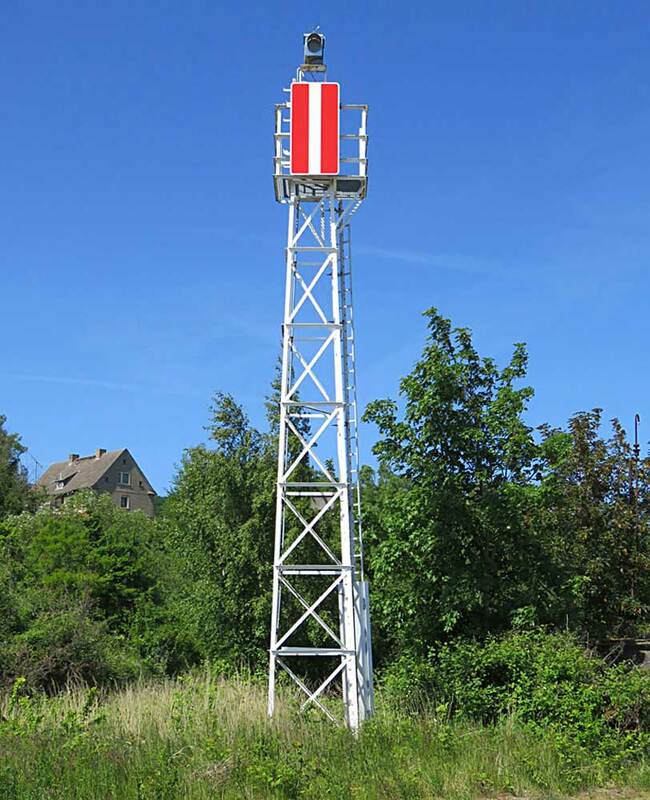 Active; focal plane 19 m (62 ft); red light occulting twice every 10 s. 17 m (56 ft) square skeletal tower, painted with red and white horizontal bands. The tower also carries a large rectangular daymark painted white with a black border. Trabas has a photo by Klaus Potschien and Google has a satellite view. The front light is on a smaller skeletal tower. This range guides vessels eastbound as they depart the Strelasund. Located in a forest near the southern tip of Rügen. Site status unknown. Admiralty C2628.1; NGA 6032. 1937. Active; focal plane 12 m (40 ft); white light occulting once every 6 s. 12 m (39 ft) round concrete tower, painted white. No lantern. Werning has a good page for the lighthouse, Hartmann has a page for the range, Trabas has a closeup photo by Klaus Potschien, and Google has a satellite view. This light is the front light of the entrance range for the Strelasund, the eastern approach to the port of Stralsund. The range replaced the lightship Palmerort. The rear light is on a skeletal tower built in 1949. The lighthouse stands on the beach and is surrounded by water at high tide. Located on a point of land about 1 km (0.6 mi) southeast of the Glewitz ferry terminal on the southeastern shore of Rügen. Site open, tower closed. Operator: WSA Stralsund. ARLHS FED-150; Admiralty C2626; NGA 6020. 1949. 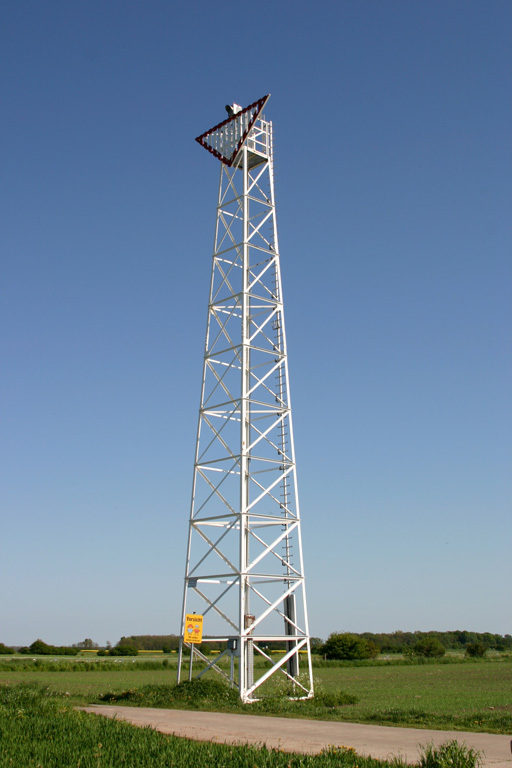 Active; focal plane 29 m (95 ft); white light occulting once every 6 s. 18 m (59 ft) square skeletal tower with gallery and a diamond-shaped daymark. Hartmann has a page for the range, Trabas has a photo by Klaus Potschien and Google has a satellite view. Located in a farm field 675 m (0.42 mi) west northwest of the front light. Site and tower closed. Admiralty C2626.1; NGA 6024. 1937. 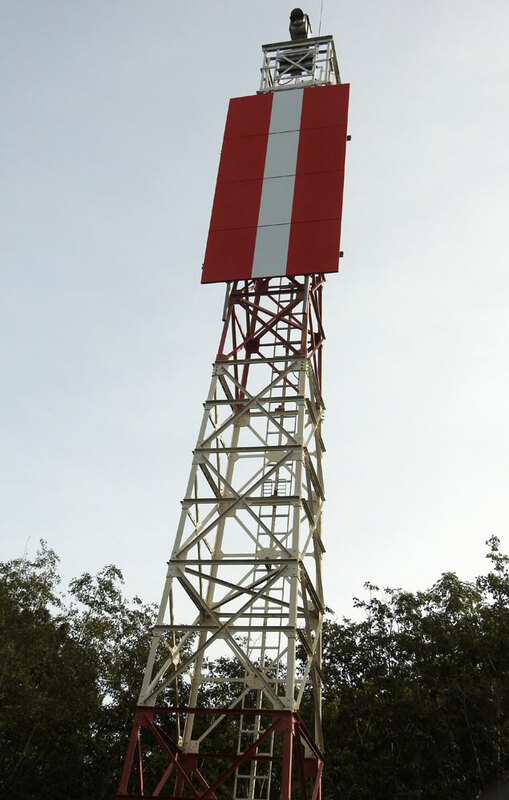 Active; focal plane 15 m (49 ft); green light occulting twice every 10 s. 14 m (46 ft) square skeletal tower, painted white with a red horizontal band. 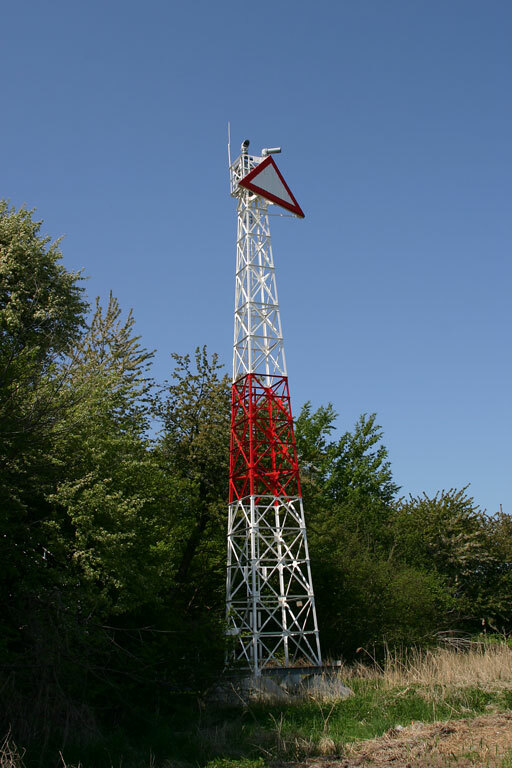 The tower also carries a triangular daymark, point up, painted white with a red border. Trabas has a photo by Klaus Potschien and the tower is close to the water in Google's satellite view. This range guides vessels westbound toward Stralsund as they approach the Drigger Ort (Drigge peninsula). Located on the waterfront of Drigge, a village on the low peninsula projecting into the Strelasund. Site open, tower closed. Admiralty C2638; NGA 6064. 1937. Active; focal plane 24 m (79 ft); green light occulting twice every 10 s (synchronized with the front light). 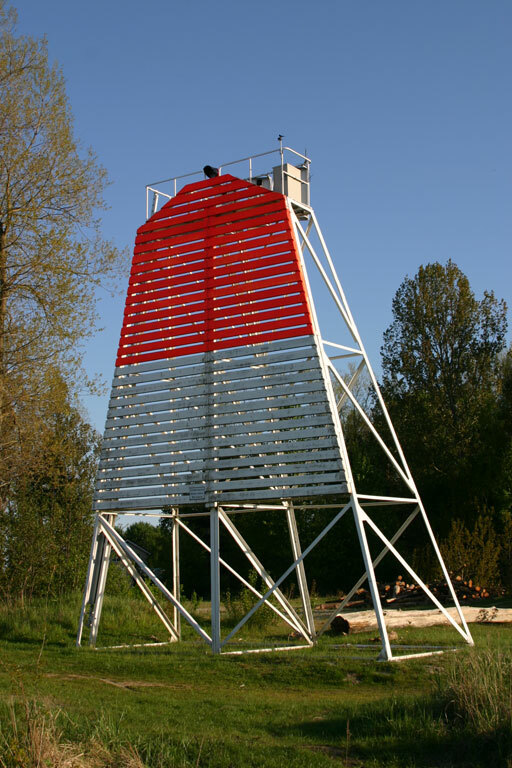 23 m (75 ft) square skeletal tower, painted with red and white horizontal bands. The tower also carries a diamond-shaped daymark, painted white with a red border. Trabas has a photo by Klaus Potschien and Google has a satellite view. Located 535 m (1/3 mi) northwest of the front light. Site open, tower closed. Admiralty C2638.1; NGA 6068. 1988. 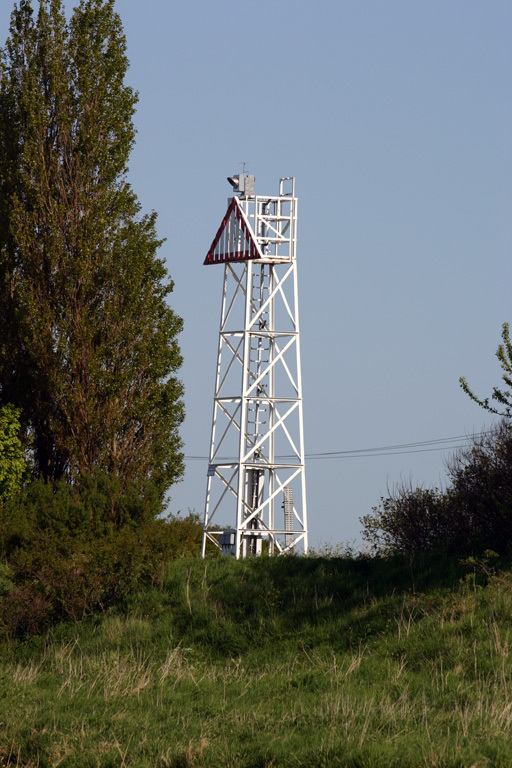 Active; focal plane 15 m (49 ft); white, red or green light depending on direction, occulting once every 6 s. 13 m (44 ft) square skeletal tower, painted with red and white horizontal bands. Trabas has a photo, Joachim Spengler has a pier view, Joshua Smith has a street view, and Google has a satellite view. 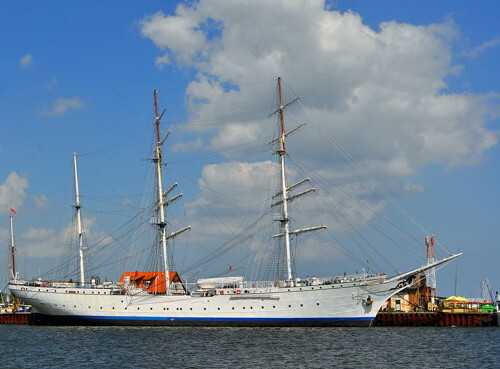 Located on the main quay in downtown Stralsund, near the tall ship Gorch Fock I; the light is at the right of Wikimedia's 2013 photo of the ship, seen at right. Site open, tower closed. Admiralty C2585.45. 1938. Active; focal plane 24 m (79 ft); white, red or green light depending on direction, 2 s on, 2 s off. 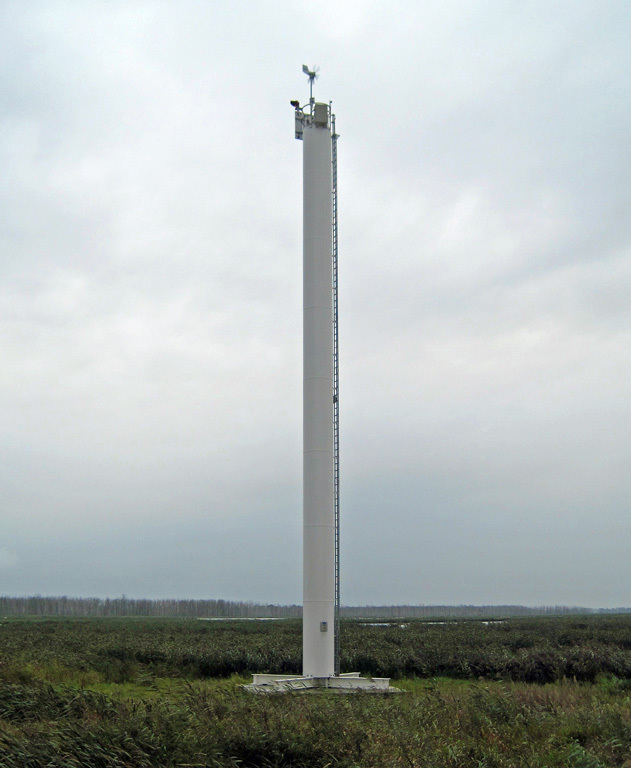 21 m (69 ft) square skeletal tower, painted white. Trabas has a photo, and Google has a satellite view. 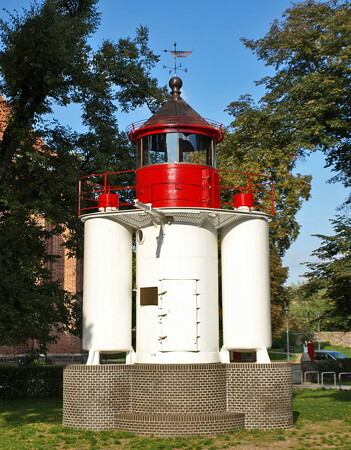 The original rear range light was replaced in 2014 with the three-color directional light; it guides vessels southbound to the Stralsund waterfront. 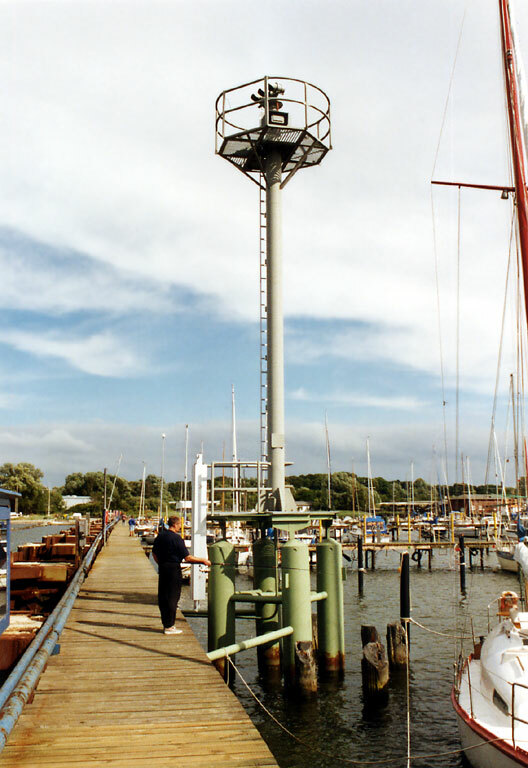 The front light, on a mast in a marina at the west end of the island of Dänholm, was deactivated in 2015. Located at the foot of the Ziegelstraße on the Stralsund waterfront, between the old and new Rügen Bridges. Site open, tower closed. Admiralty C2585.6. 1937. 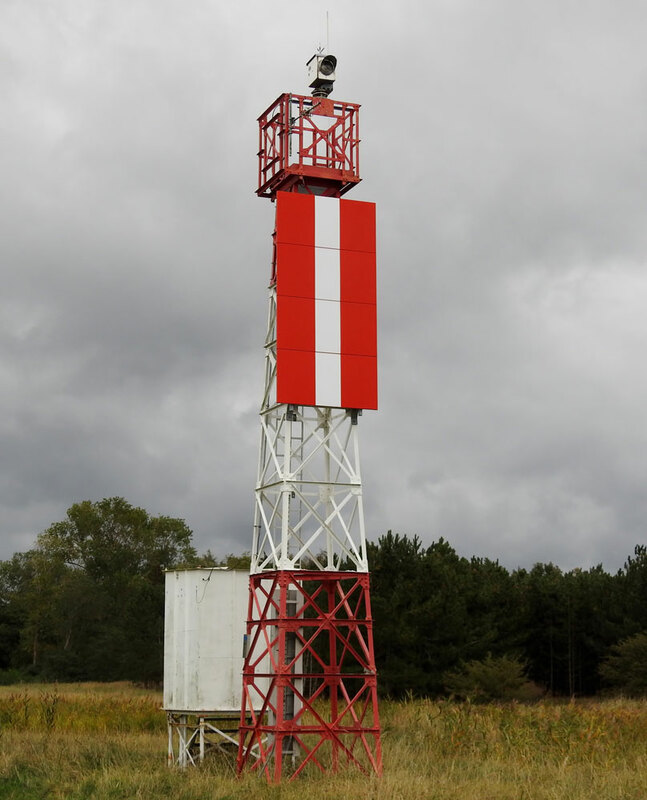 Active; focal plane 22 m (72 ft); red, white,or green light, depending on direction, occulting once every 6 s. 14 m (46 ft) square skeletal tower, painted white with a red horizontal band. 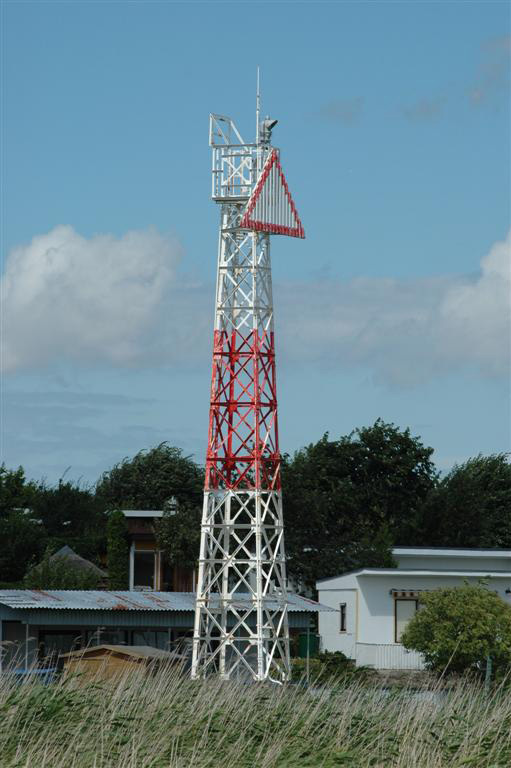 The tower also carries a triangular daymark, point up, painted white with a red border. Trabas has a photo and Google has a satellite view. 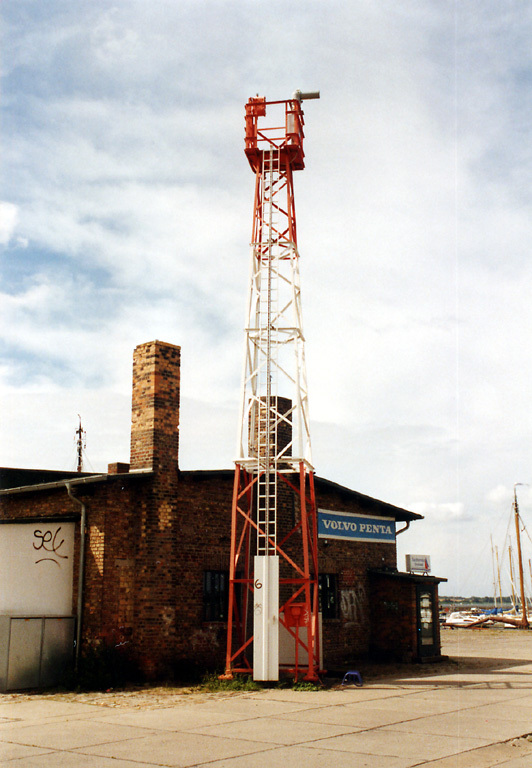 This tower carries the front light of a range guiding vessels westbound (approaching Stralsund) as well as a leading (sector) light that guides vessels eastbound (departing Stralsund). Located on the waterfront just southeast of Andershof, a village on the Strelasund south of Stralsund. Site open, tower closed. Admiralty C2644; NGA 6084. 1937. Active; focal plane 39 m (128 ft); green light occulting once every 6 s (synchronized with the front light). 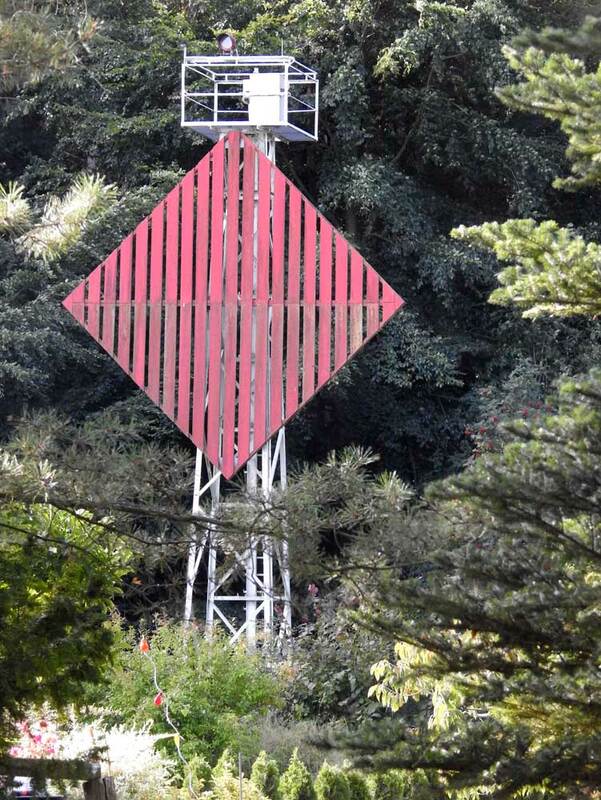 15 m (49 ft) square skeletal tower, painted with red and white horizontal bands. The tower also carries a huge pentagonal daymark, painted white with a red border. Trabas has a photo and Google has a satellite view. This is the rear light for the westbound range (see previous entry). Located 440 m (1/4 mi) south southwest of the front light. Site open, tower closed. Admiralty C2644.1; NGA 6096. 1937. Active; focal plane 40 m (131 ft); white light, 5 s on, 1 s off. 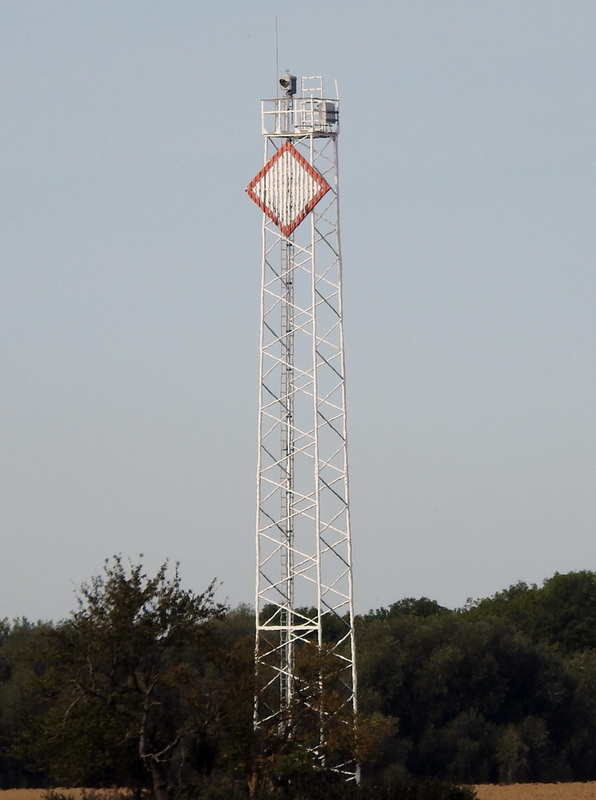 29 m (95 ft) square skeletal tower painted white and carrying a diamond-shaped daymark painted white with a red border. Trabas has a photo, and Google has a satellite view. 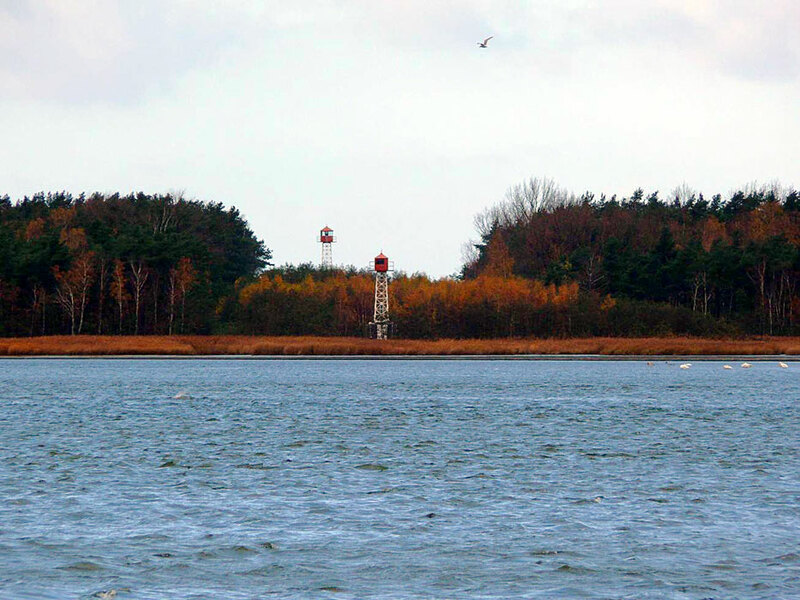 This is the entrance range guiding vessels across the Greifswalder Bodden (Greifswald Bay), a roughly circular bay between Rügen and Peenemünde.The front light is on a much smaller tower. Located at the edge of a farm field southeast of Reinberg. Site and tower closed. Admiralty C2652.81; NGA 6016. Date unknown. 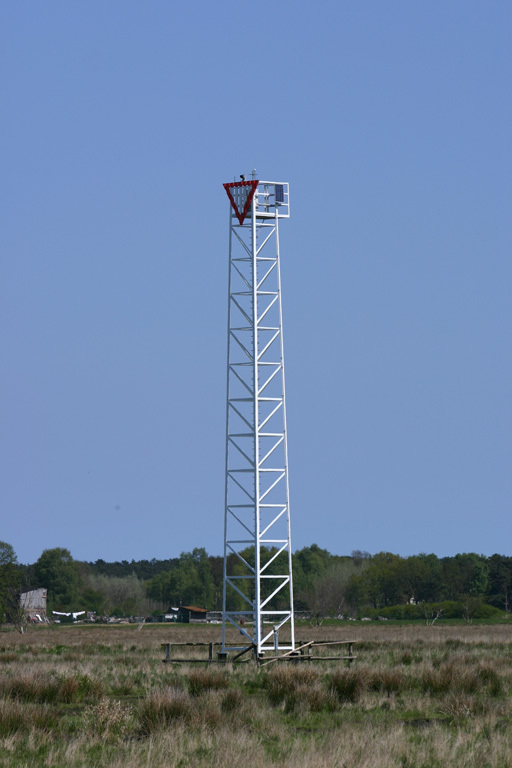 Active; focal plane 22 m (72 ft); white, red, or green light depending on direction, occulting twice every 10 s. 19 m (62 ft) square skeletal tower, painted white. The tower also carries a diamond-shaped daymark, painted white with a red border. Trabas has a photo, and and the light is centered in a Google satellite view. This light was formerly the rear light of a range, but it has been converted to a directional light. It guides vessels entering the Ryck estuary from Greifswald Bay (Greifswalder Bodden). Located in a residential neighborhood on the east side of Greifswald. Site and tower closed (private property), but the light can be seen from nearby streets. Admiralty C2655.2; NGA 6004. 1832. Inactive since 1855. Approx. 12 m (40 ft) octagonal pyramidal red brick tower; lantern replaced by a square cap. The Anke/Jens site has a great closeup photo, and Google has a satellite view. Located near the 1855 lighthouse. Site open, tower closed. 1855 (station established 1832). Active; focal plane 49 m (161 ft); white flash every 3.8 s. 39 m (128 ft) octagonal brick tower with lantern and double gallery rising from a square 1-story base. Tower is unpainted red brick, lantern and galleries painted black. A magnificent 3-faceted 1st order Fresnel lens (1913) is in use. 2-1/2 story square brick keeper's house. 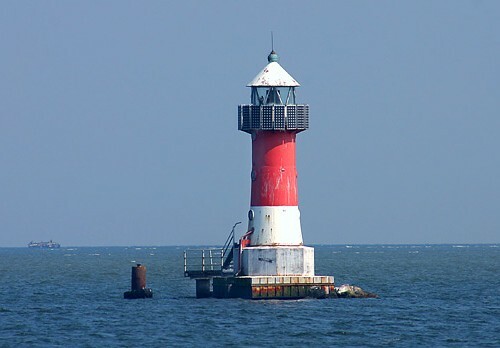 Werning has a very good page for the lighthouse, Huelse has a great photo, Trabas has a photo by Klaus Potschien, B.F. Fertig has a 2014 photo, and Google has a satellite view of the station. 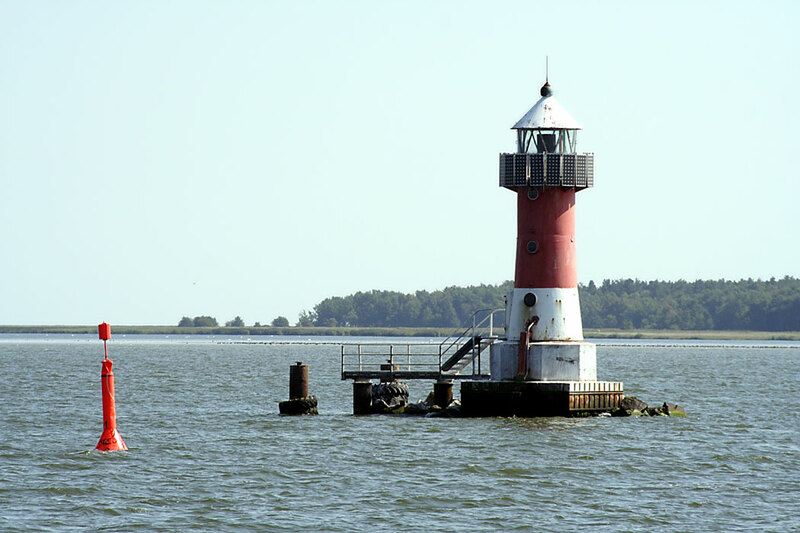 A beautiful but rarely visited light station, this is the traditional landfall light for ships approaching Stralsund from the northeast. From 1937 to 1945 the island was a launch site for the German missile development program; A4 and A5 rockets were tested here. The East German government continued the use of the island as a military base. The tiny island, a critical nesting and stopover site for birds, is now a nature preserve (Naturschutzgebiet Greifswalder Oie) managed by the Verein Jordsand, the German equivalent of the Audubon Society in the U.S. Visits to the island require a permit from the Verein or participation in one of the association's activities. The lighthouse is located at the northeastern corner of the island, 1.4 km (0.9 m) from the protected harbor at the other southwestern end. Accessible only by boat and hiking the length of the island, about 1.6 km (1 mi). Site open, tower closed. Operator: WSA Stralsund. Site manager: Verein Jordsand. ARLHS FED-006; Admiralty C2662; NGA 5940. Note: Ruden is a small island on the south side of the entrance to Greifswald Bay, just off the town of Peenemünde. 1972. Active; focal plane 10 m (33 ft); two very-quick flashing white lights, one on either side of the structure. 10 m (33 ft) round concrete caisson carrying two antenna masts. Trabas has Hartmann's photo This structure was built by the East German government as part of its air traffic control for the Peenemünde air force base. The former base is now a civilian airport, and the structure is not in use for its original purpose. However, it has a navigational purpose, marking the east side of an extensive shoal. Located about 4 km (2.5 mi) southwest of Ruden island. Accessible only by boat. Site open, tower closed. Admiralty C2658.8. 1972. Active; focal plane 10 m (33 ft); two very-quick flashing white lights, one on either side of the structure. 10 m (33 ft) round concrete caisson carrying two antenna masts. Trabas has Hartmann's photo and Google has a satellite view. This structure was built by the East German government as part of its air traffic control for the Peenemünde air force base. The former base is now a civilian airport, and the structure is not in use for its original purpose. Located in the water 1 km (0.6 mi) northwest of the airport. Accessible only by boat. Site open, tower closed. Admiralty C2659.03. 1954. Active; focal plane 25 m (82 ft); white, red, or green light, depending on direction, occulting once every 6 s. 23 m (75 ft) square skeletal tower with gallery. Tower painted white; NGA lists a red lantern but there is no lantern shown in Trabas's photo by Helmut Seger. Google has a satellite view. The light guides vessels on a due-east reach across Greifswald Bay. 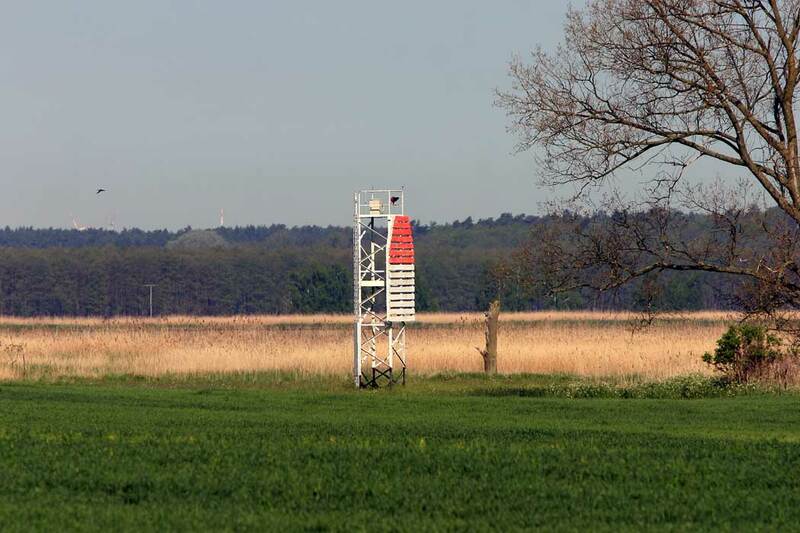 Located at the north end of the island of Ruden about 2.5 km (1.5 mi) north of the Peenemünde airport. Accessible only by boat. Site status unknown. Operator: WSA Stralsund. Admiralty C2656.6; NGA 5944. 1954. Active; focal plane 8 m (26 ft); white light occulting once every 6 s. 9 m (30 ft) round tapered gray concrete tower with lantern and gallery, unpainted. Werning has a page for the lighthouse, and Bing has a satellite view. The range guides vessels southwest toward Ruden and Peenemünde. Located off the east side of the low island of Ruden, about 6 km north of the mainland near Peenemünde. Accessible only by boat. Site and tower closed. Operator: WSA Stralsund. ARLHS FED-312; Admiralty C2657.9; NGA 5956. 2014 (station eastablished 1954. Active; focal plane 16 m (52 ft); white light occulting once every 6 s. 15 m (49 ft) steel post carrying a hexagonal lantern. 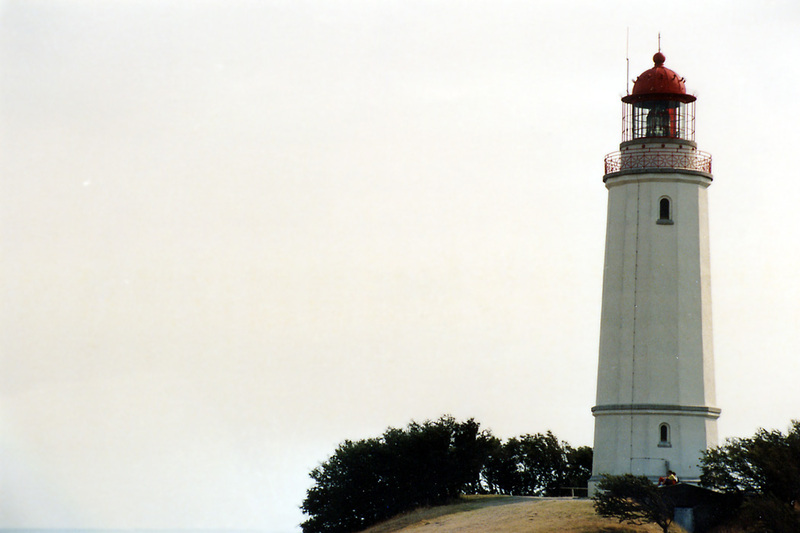 The lighthouse is white with a red balnd at the base and a small black band near the top. Trabas has Hartmann's photo and Google has a satellite view. The light replaced a skeletal tower also seen on Hartmann's page. Located near the south end of Ruden, about 700 m (0.44 mi) west southwest of the front light. Accessible only by boat. Site open, tower closed. Operator: WSA Stralsund. ARLHS FED-313; Admiralty C2658.1 NGA 5960. 1954. Active; focal plane 12 m (39 ft); white, red, or green light, depending on direction, occulting once every 6 s. 11 m (33 ft) round concrete tower with lantern and gallery. 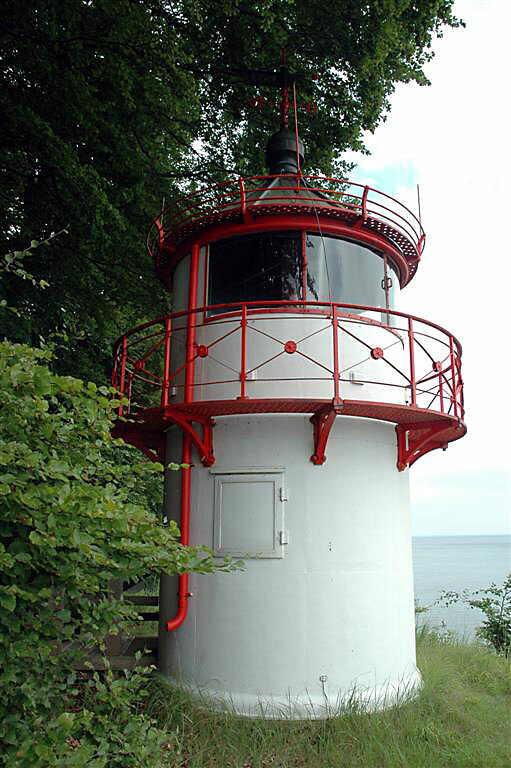 Lighthouse painted red with a white horizontal band at the base; lantern roof is also white. The photo from Werning's page is at right, Trabas also has a good closeup by Helmut Seger, and Google has a satellite view. This lighthouse carries two directional lights, one aimed north northeast and the other west northwest. Located about 4 km (2.5 mi) offshore north of Peenemünde and southeast of the Ruden Unterfeuer. Accessible only by boat. Site and tower closed. Operator: WSA Stralsund. ARLHS FED-189; Admiralty C2659; NGA 5968. Note: Usedom is a long island along the south shore of the Baltic Sea; the island extends eastward across the international border into Poland. The town of Peenemünde is at the west end of Usedom. The Peenestrom is the strait separating Usedom from the mainland. The narrow strait leads southeast from Peenemünde to the Stettiner Haff (also called the Oderhaff), a large lagoon on the south side of Usedon. 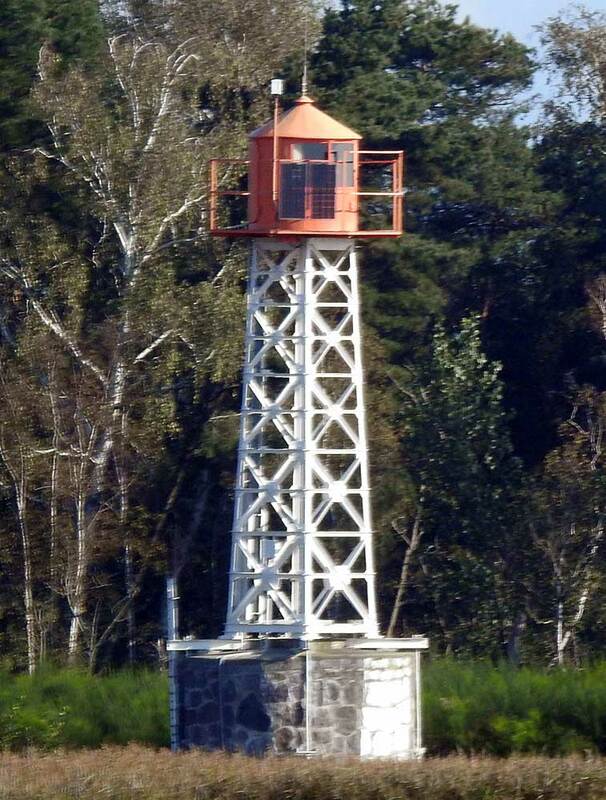 A large number of range lights guides navigation on the Pennestrom; only the larger towers are described here. 2006. Active; focal plane about 14 m (46 ft); yellow flash every 4 s. 14 m (46 ft) post carrying a large round diving bell (Tauchgondol) that can be lowered on the post. Trabas has a photo, Bernd Fechner has a 2016 photo, and Google has a pier view and a satellite view. 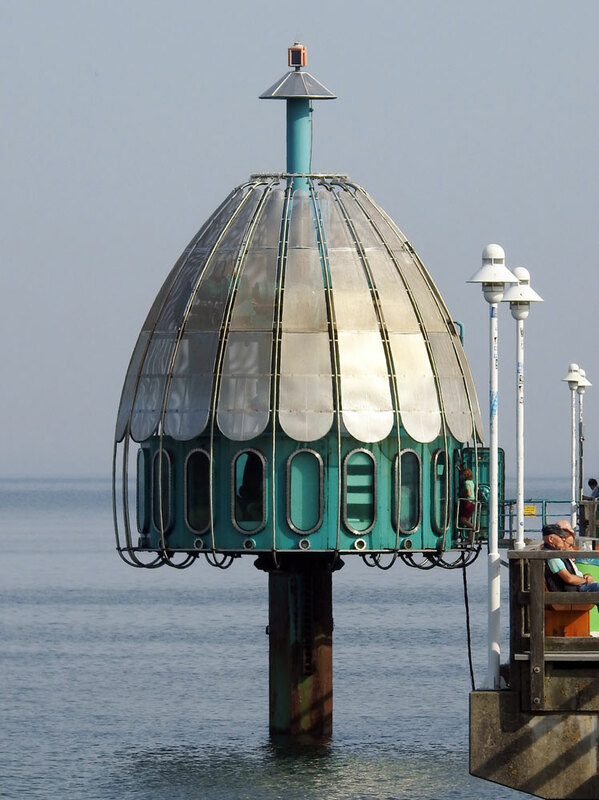 The diving bell is a tourist attraction, one of several such attractions Germany's Baltic coast. Located near the end of the pier at Zinnowitz, a resort town about 15 km (9 mi) southeast of Peenemünde. Site and diving bell open. Admiralty C2666. Date unknown. Active; focal plane 25 m (82 ft); red light occulting once every 6 s. Approx. 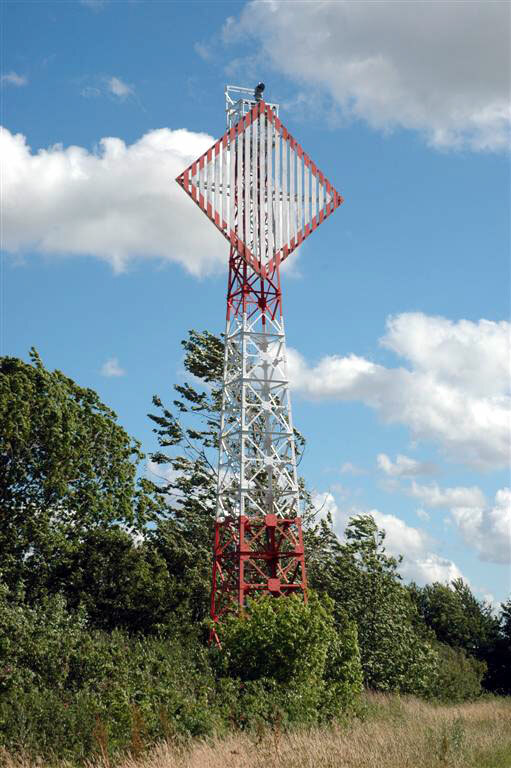 13 m (46 ft) square white skeletal tower carrying a large diamond-shaped red slatted daymark. Trabas has a photo and Google has a satellite view. This is the approach range from the north to Peenemünde. The front light is on a much shorter tower. Located at the edge of the forest behind Freest, a town on the west side of the entrance to the Peenestrom. Site status unknown. Admiralty C2659.06. Date unknown. Active; focal plane 33 m (108 ft); white light, 4 s on, 4 s off. Approx. 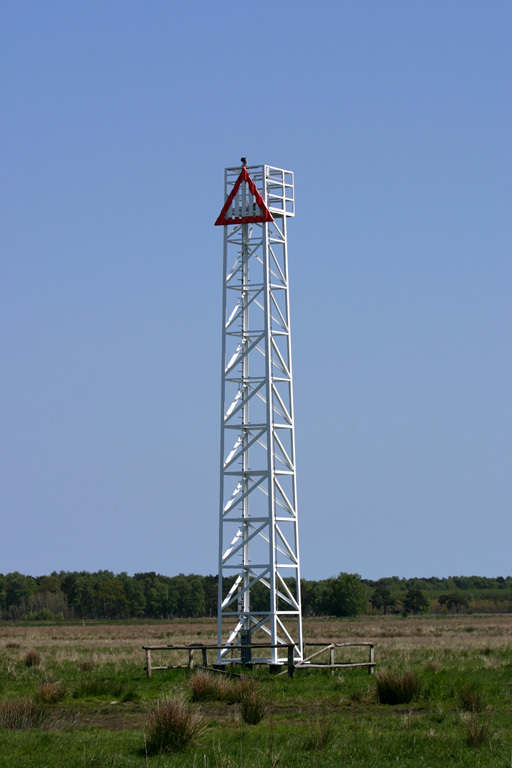 25 m (82 ft) square cylindrical skeletal tower carrying a triangular daymark, point down. Trabas has a photo and Google has a satellite view. This is the approach range from the northwest to Peenemünde. The front light is on a much shorter tower. Located on the Flughafenring in Peenemünde. Site appears open, tower closed. Admiralty C2659.11. Date unknown. Active; focal plane 12 m (39 ft); white, red or green light depending on direction occulting once every 6 s. Approx. 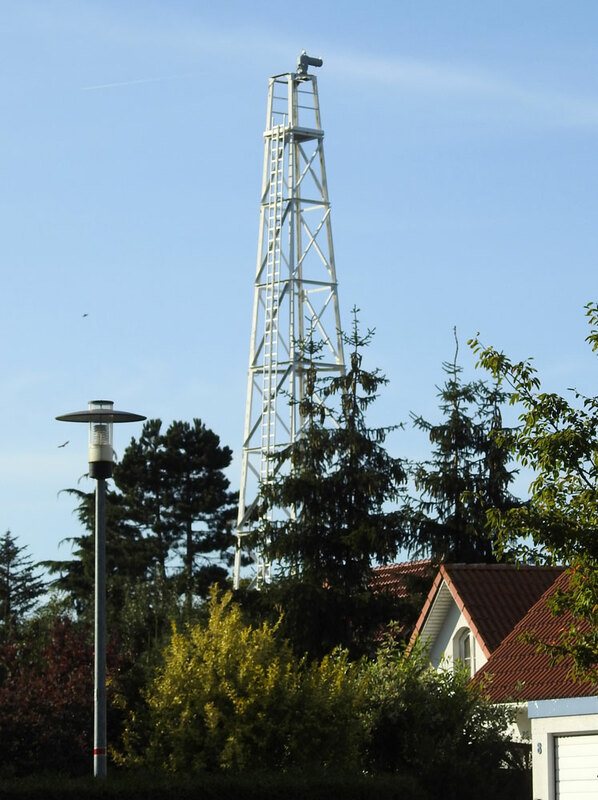 10 m (33 ft) robust steel mast carrying a hexagonal lantern. Lighthouse painted with red and white horizontal bands. Trabas has a photo and Google has a satellite view. 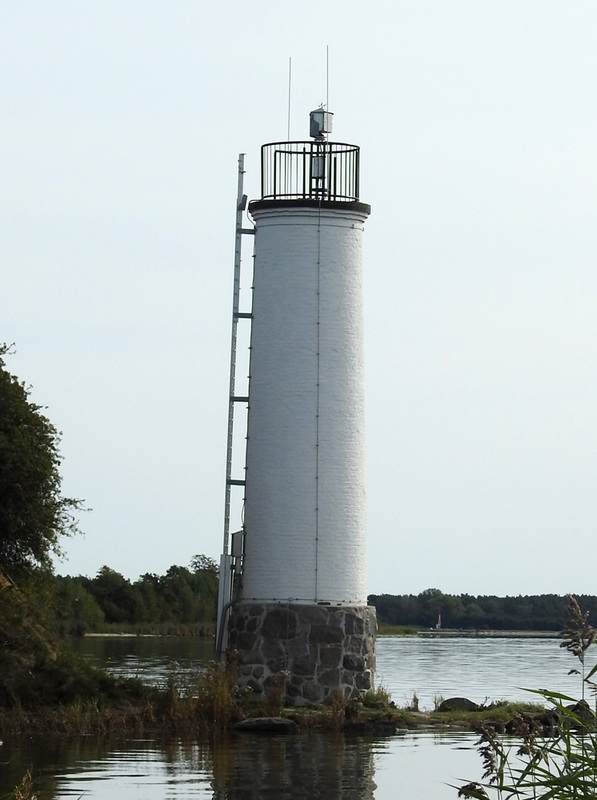 This leading light guides vessels approaching Peenemünde northbound in the Pennestrom. Located on the waterfront of Peenemünde. Site open, tower closed. Admiralty C2659.13; NGA 5969. Date unknown. Active; focal plane 20 m (66 ft); white light occulting four times every 15 s. Approx. 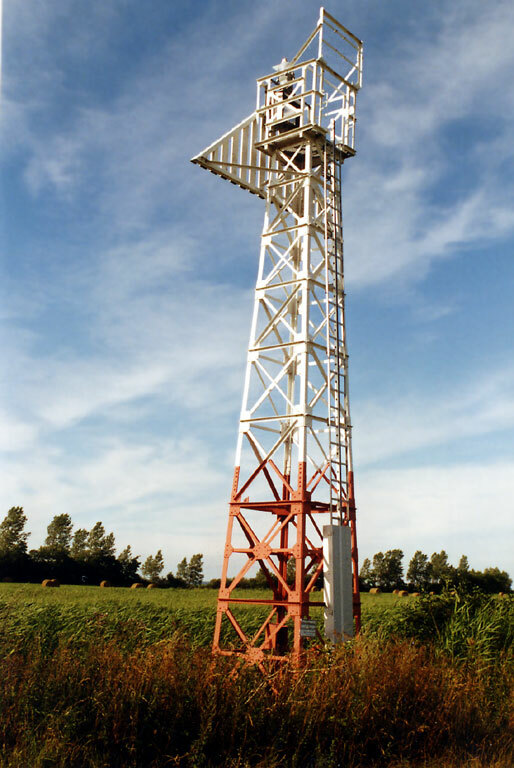 19 m (62 ft) square white skeletal tower carrying a triangular daymark, point down. Trabas has a photo and Google has a satellite view. This range guides eastbound vessels. The front light is on a similar but shorter tower. Located in a field southwest of Karlshagen. Site status unknown. Admiralty C2659.47. Date unknown. Active; focal plane 27 m (89 ft); two white lights: one occulting four times every 15 s for the southbound Rankwitz range and one occulting twice every 10 s for the north bound Krienke range. Approx. 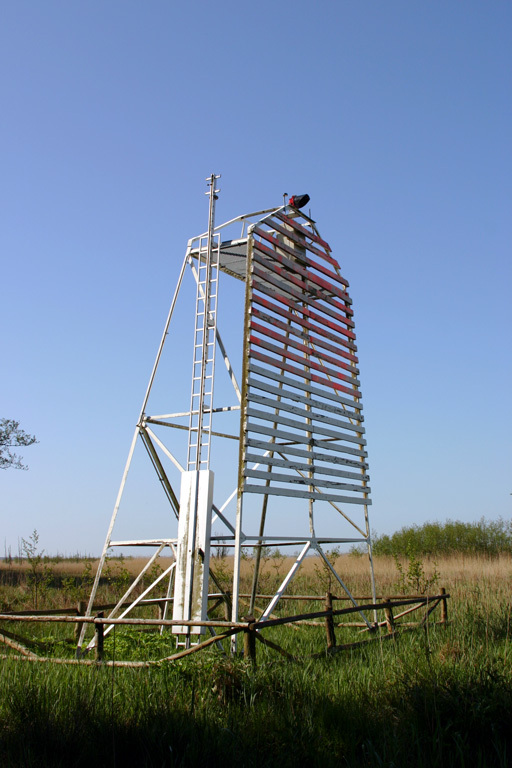 25 m (82 ft) square skeletal tower, painted white with a red horizontal band. 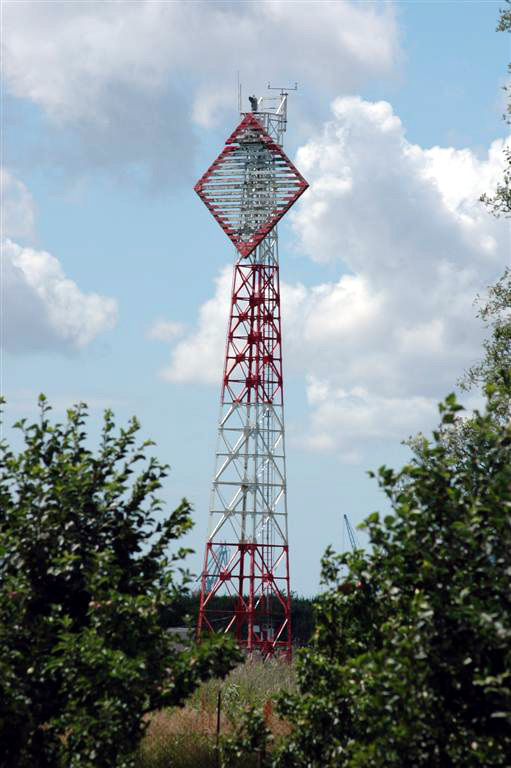 The tower also carries two diamond-shaped daymarks, painted white with red borders, once for each range. Trabas has a photo and Google has a satellite view. The Rankwitz and Krienke front lights are on much shorter towers. Located in a farm field on the west side of Usedom, about 3 km (2 mi) south of Rankwitz. Site status unknown. Admiralty C2659.87. Date unknown. 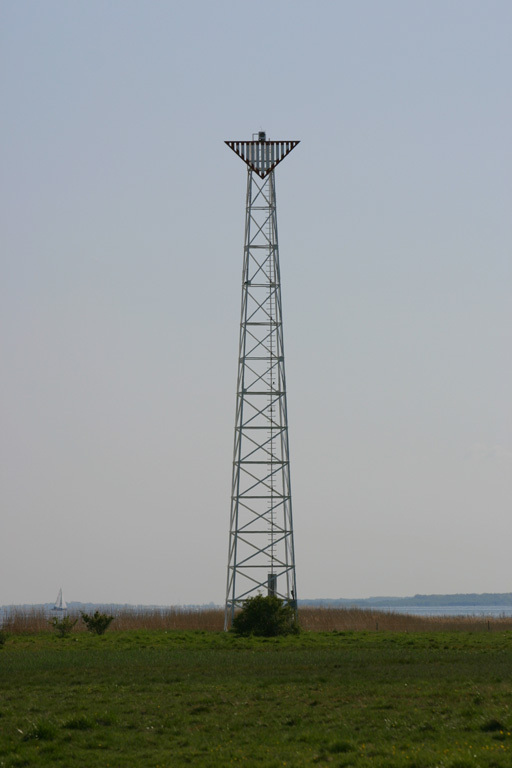 Active; focal plane 23 m (75 ft); white light occulting three times every 15 s. 21 m (69 ft) square skeletal tower carrying a large triangular daymark, point down. Daymark painted white with a red border. Trabas has a photo, Piotr Deresiński has another photo and Google has a satellite view. This range guides southbound vessels approaching the narrowest passage of the Peenestrom. The front light is on a small skeletal mast. Located on the grounds of a restaurant and guesthouse beside the east end of the Zecheriner Bridge, which connects the mainland to Usedom at the southwestern corner of the island. Site open, tower closed. Site manager: Peene-Idyll. Admiralty C2659.98. Date unknown. Active; focal plane 17 m (56 ft); white light occulting twice every 10 s. Approx. 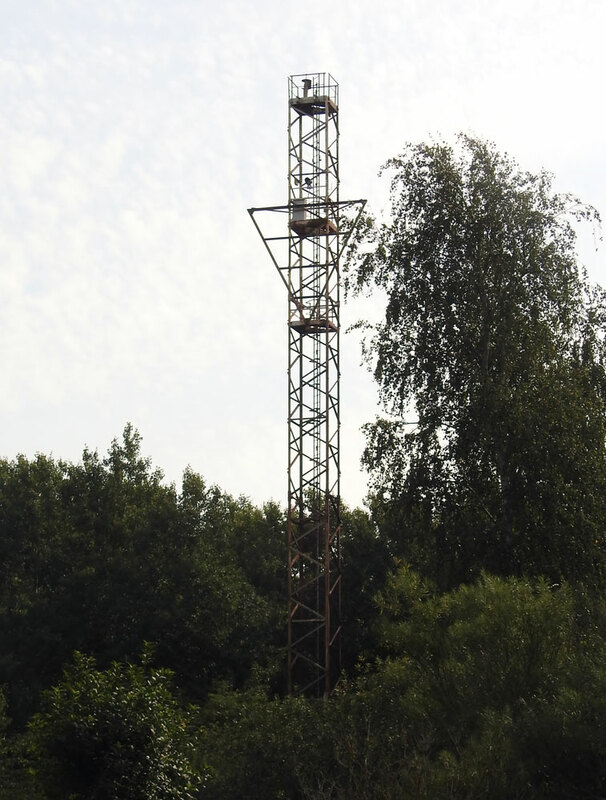 16 m (52 ft) square skeletal tower carrying a large triangular daymark, point down. Daymark painted white with a black border. Trabas has a photo and Google has a satellite view. The range guides southbound vessels after they pass the Zecheriner Bridge. The front light is on a much shorter tower. Located in a farm field west of Anklamer. Site status unknown. Admiralty C2660.08. Date unknown. Active; focal plane 18 m (59 ft); white light occulting four times every 15 s. Approx. 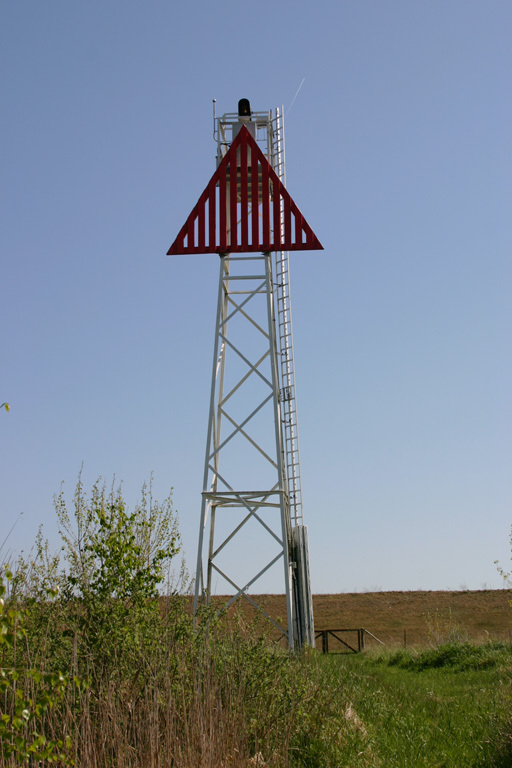 16 m (52 ft) square skeletal tower carrying a large triangular daymark, point down. Daymark painted white with a black border. Trabas has a photo and Google has a satellite view. The range guides northbound vessels after they enter the Peenestrom. The front light is on a similar but shorter tower. Located beside the Anklamer Fähre (Anklamer Ferry) road. Site open, tower closed. Admiralty C2660.15. Note: The Stettiner Haff is a large lagoon at the mouth of the Oder River, which forms the border between Germany and Poland. Only the western third of the lagoon lies in Germany. In Polish the lagoon is called the Zalew Szczecinski. Date unknown. Replaced in 2011, this was a 24 m (79 ft) square skeletal tower with a square lantern and gallery, painted white with a red lantern roof. 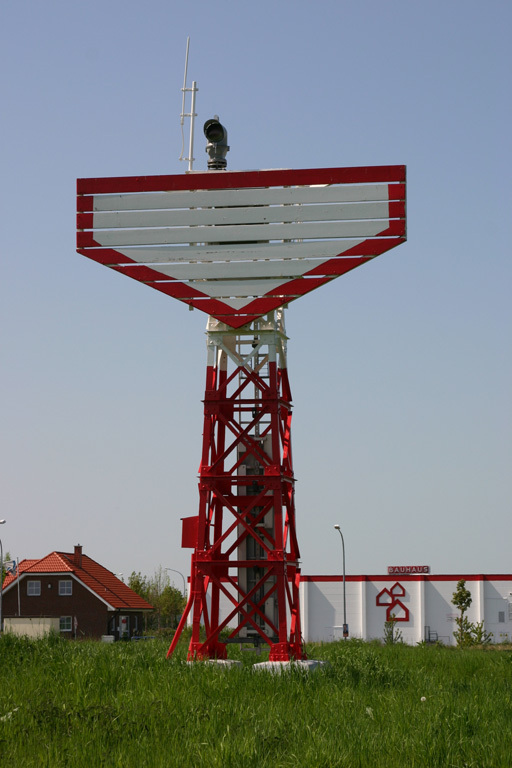 The light (focal plane 25 m (82 ft); white light occulting three times every 15 s) is now on a robust steel mast, painted white; Trabas has Hartmann's photo and Google has a satellite view. This range guides vessels leaving the Oderhaff for the Peenestrom channel, which leads around the western end of Usedom. Located in a field at the extreme western end of the Oderhaff, on the south side of the Strom entrance. Site open, tower closed. Operator: WSA Stralsund. Active light: Admiralty C2867.1; NGA 6492. 2000 (station established 1844). Active; focal plane 11 m (36 ft); white light occulting once every 6 s. 11 m (36 ft) round cylindrical fiberglass tower with lantern and gallery. Tower is white, lantern and gallery red; the arms of the city of Ueckermünde are displayed on the front of the tower. Denis Apel's photo is at right, the Anke/Jens site has excellent photos, Trabas has a good closeup by Helmut Seger, Hartmann has a page for the lighthouse, and Google has a street view and a satellite view. 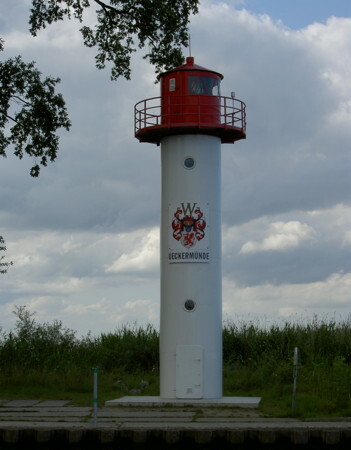 This light marks the entrance to the river Uecker at Ueckermünde on the southwest shore of the Oderhaff. Michel Forand has a 1916 postcard view of the second lighthouse and a much later postcard view of the third lighthouse, a skeletal tower built in 1925. Site open, tower closed. Operator: WSA Stralsund. ARLHS FED-244; Admiralty C2860; NGA 6484. 1910 (Julius Pintsch). Inactive since 1982. 13 m (43 ft) round cylindrical cast iron tower with lantern and gallery, originally mounted on a concrete pier. Lighthouse painted white, lantern red. This is the front tower of a pair of range lights at Barhöft abandoned by the East German government when a shift in the channel made them obsolete. 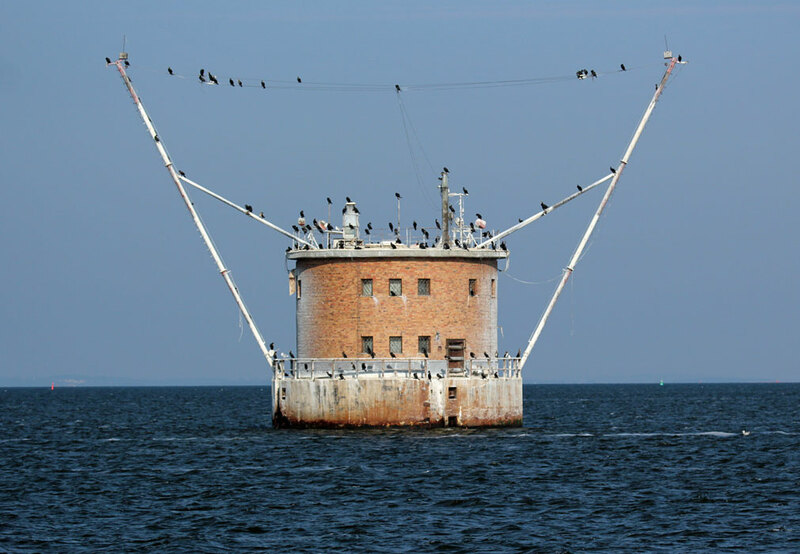 The rusting lighthouse became a roosting and nesting site for seabirds. The Leuchtturm Atlas site has a distant photo of the lighthouse on its original station, and Werning also has a distant view. In 2006 the lighthouse was removed, leaving only the stone base. After restoration, it was reassembled at the city museum in Fürstenwalde, southeast of Berlin. 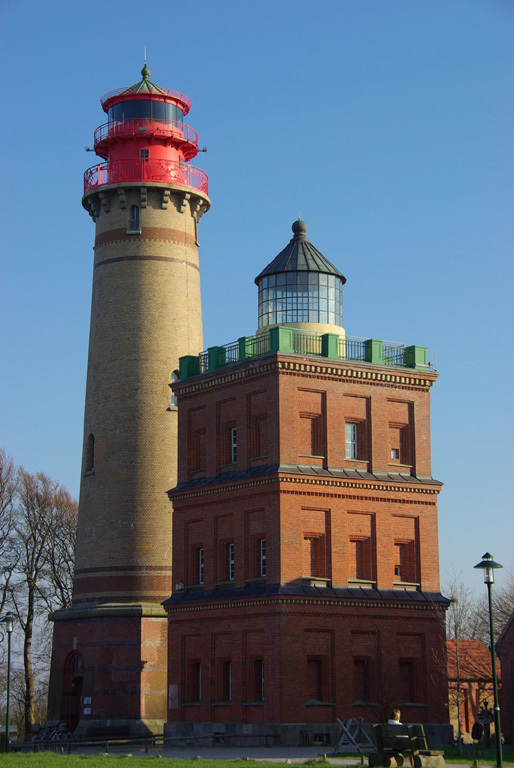 Thus the lighthouse returned home: Fürstenwalde is where it had been prefabricated by the firm of Julius Pintsch. The reconstruction was completed in June 2007. 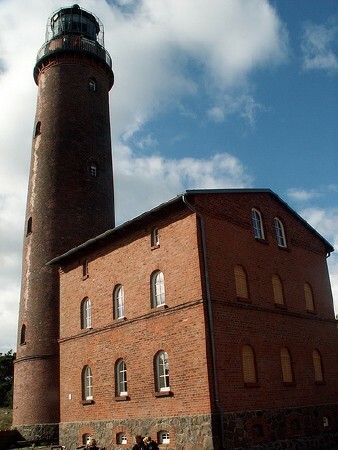 Originally located in the sound east of Barhöft, the lighthouse is now at the Fürstenwalde City Museum (Städtisches Museum Fürstenwalde). Peter Dargatz has the closeup photo of the relocated lighthouse seen at right, Wolfgang Peth has a closeup street view, and Google has an indistinct satellite view. Located on the Domplatz in Fürstenwalde. Site open, museum open daily except Mondays, tower closed. ARLHS FED-246. Arkona Peilturm (1927) looks exactly like a lighthouse, but it was built by the German Navy as an observation and control tower. Google has a street view and a satellite view and Jeffrey Martin has a 360° view from atop the tower. The tower is evidently open for climbing. Posted April 9, 2005. Checked and revised March 2, 2019. Lighthouses: 51; lightships: 1. Site copyright 2019 Russ Rowlett and the University of North Carolina at Chapel Hill.